Barf and her sweet friend, DeEtta, visited Kansas City a little over a week ago on their way to Columbia, Mo. Barf is an October baby and was on her way to an annual October babies celebration with other family & friends. Because she was turning 100 or 150 or something like that on this birthday, she was pooped out from all the driving. 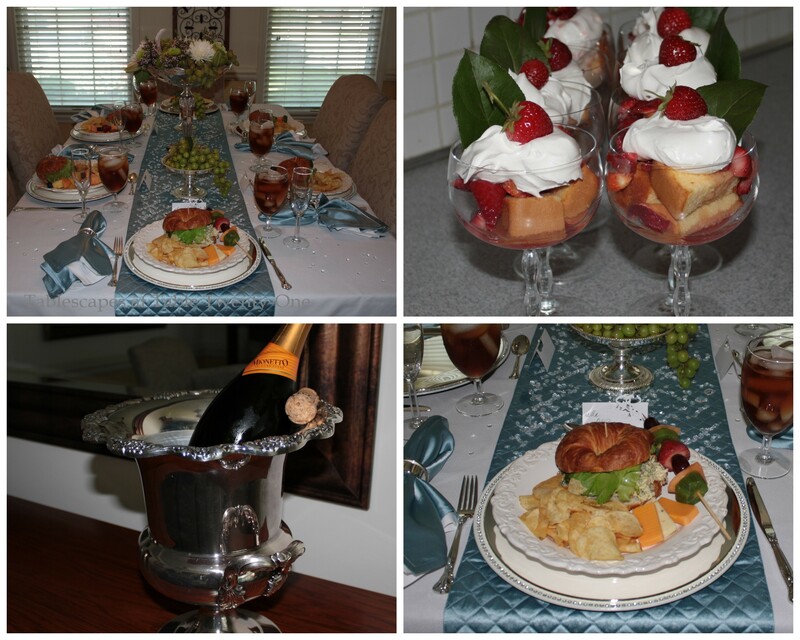 So we held a jazzed up little “come-as-you-are” birthday dinner party at our house. 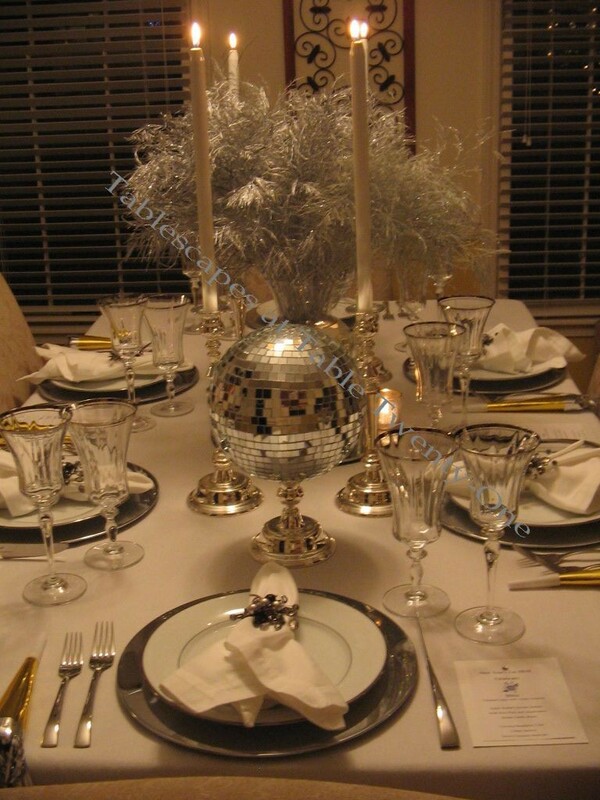 Everyone was dressed comfortably and casually, but I wanted to do something kind of swanky for the table. Barf and DeEtta had already traveled quite a distance from Minnesota and still had another two hours to drive after dinner to get to Columbia. I wanted the table to be something she would enjoy but that would also be easy to put together since I was feeling particularly lazy. So I went with spiffed up basic black. 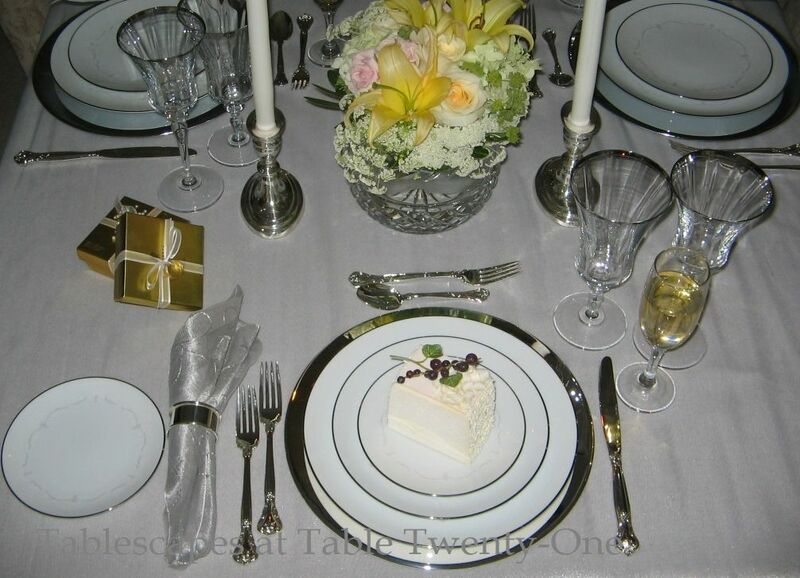 Silver metal chargers and Noritake “Spectrum” china are my “go to” pieces that take a lot of guesswork out of the whole thing. 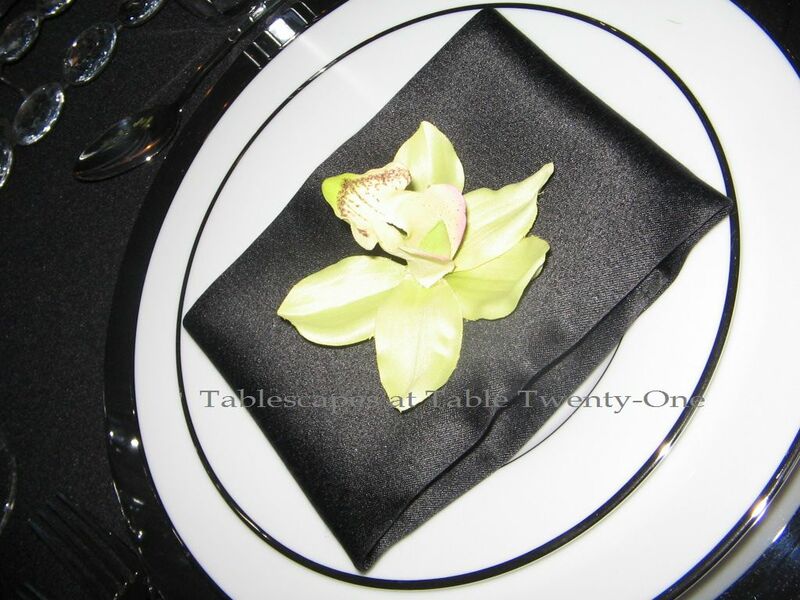 Black napkins folded into a neat little square with an orchid bloom for a shot of color. 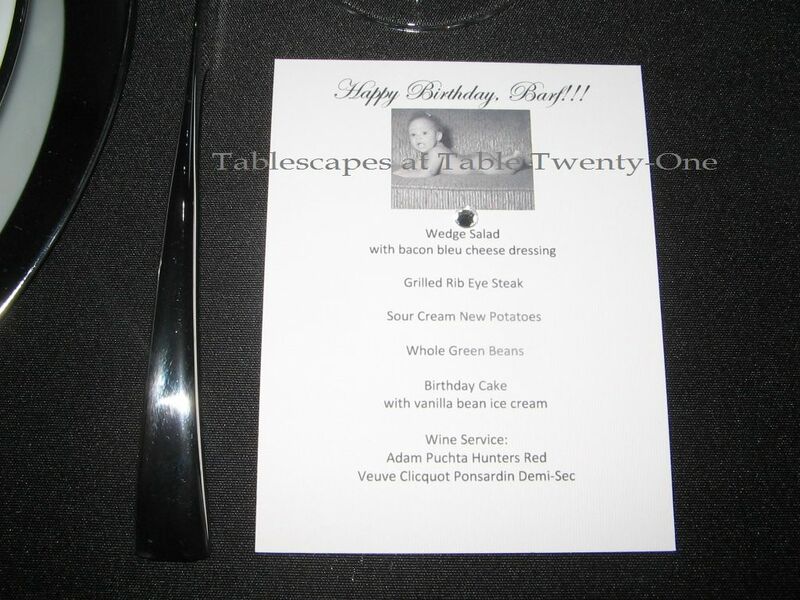 The menu card has a photo of Barf at 6 months old. Wasn’t she a cutie patootie? (Speaking of patooties, I tried to cover hers a little here with my watermark! 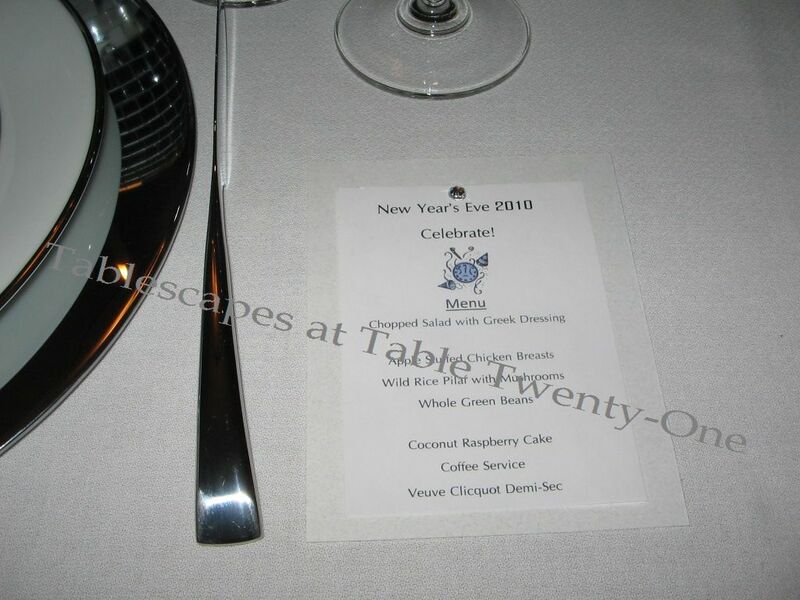 :-)) Creating these menus was my favorite part of the whole set-up! 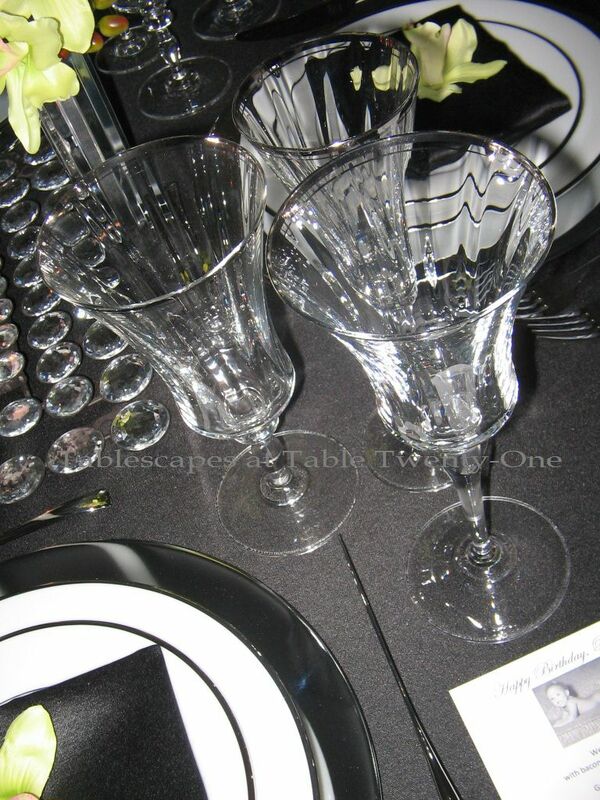 Another great “go to” is my Mikasa “Jamestown Platinum” stemware. 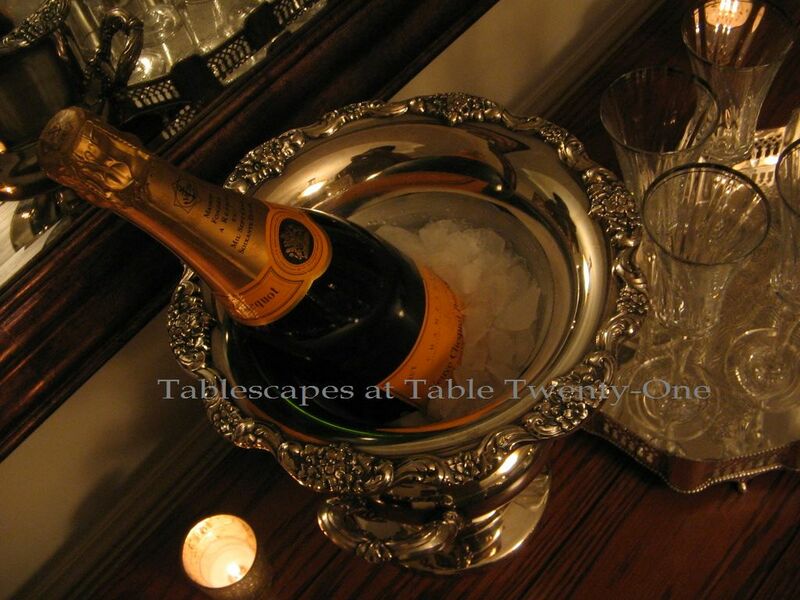 I love it for its timeless beauty, its incredible versatility, and the way it feels in my hand. It’s perfect! 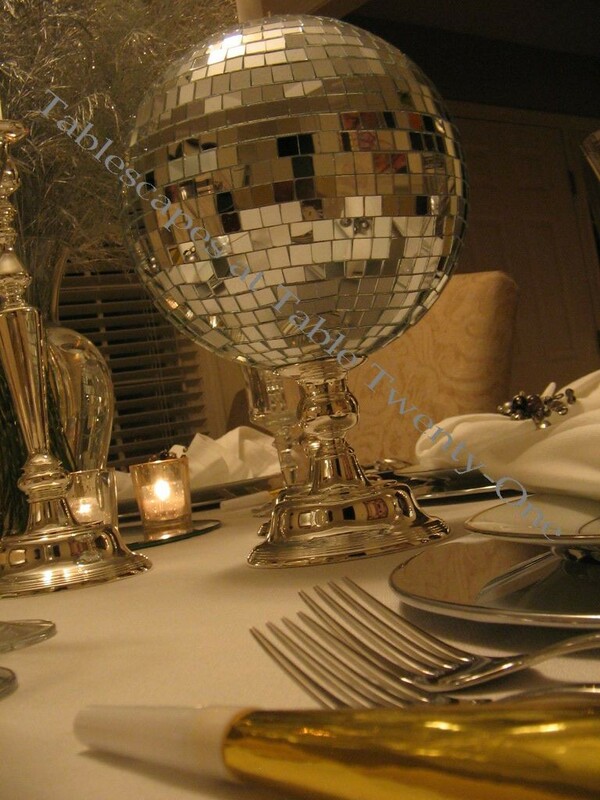 I bought these cool triple-decker bling mirrors a while back at Hobby Lobby. Yes…Hobby Lobby! 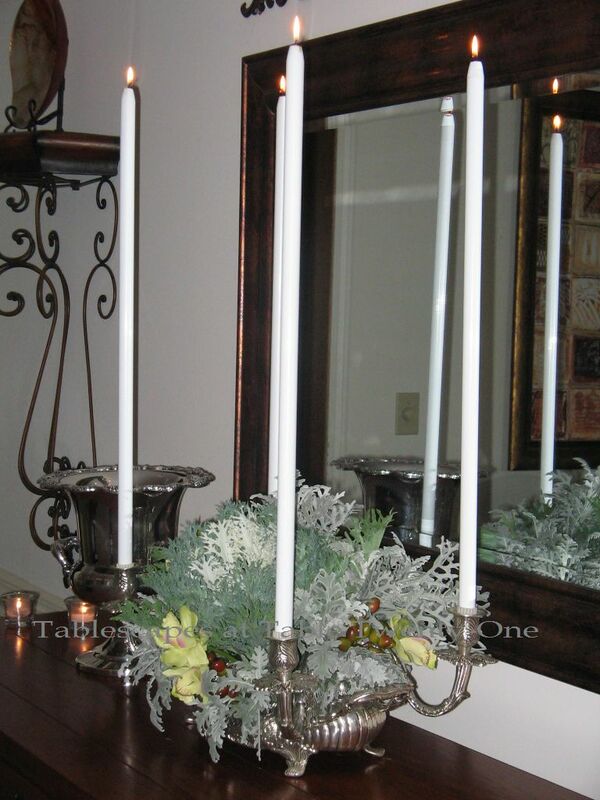 They’re very sturdy and reflect a lot of light. While they are meant to be hung on a wall, I decided they would make much better centerpiece trays. 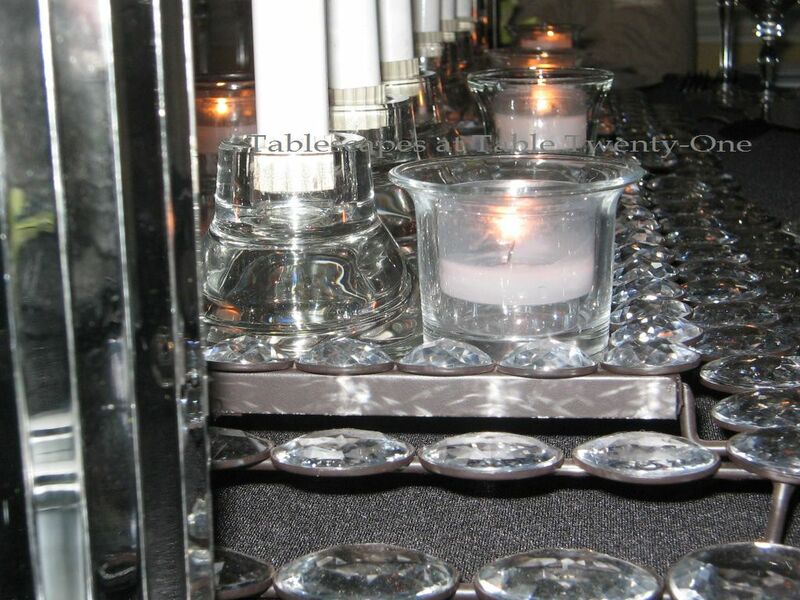 The neatly lined votive candles and 25″ metal case candles (much safer taper if you don’t want candlewax everywhere!!!) double back in the mirrors. My Dad was quite intrigued with the design. Mirrored cylinders hold a mix of bright green cymbidium orchids, dusty miller (rescued from the back yard before the frost got to it! ), and raw coffee bean clusters. 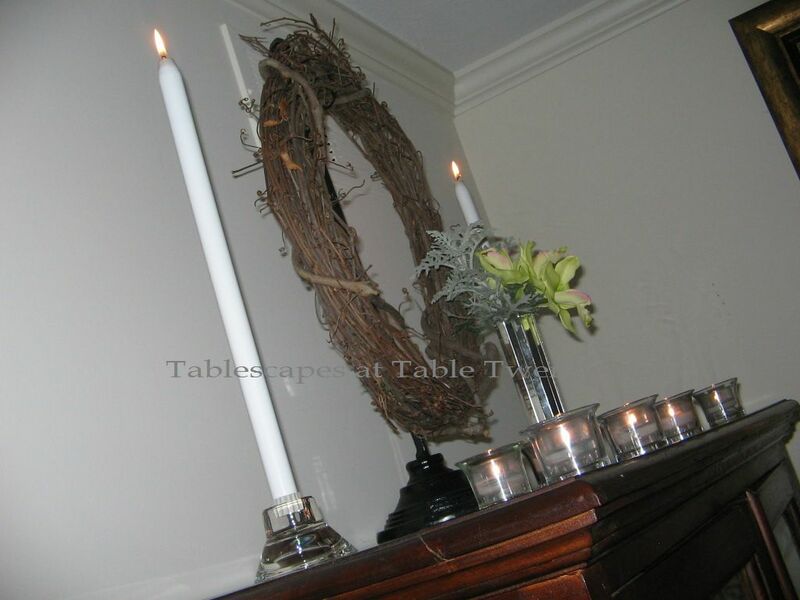 I wanted something lush for a buffet piece that leaned toward fall without screaming it out loud. 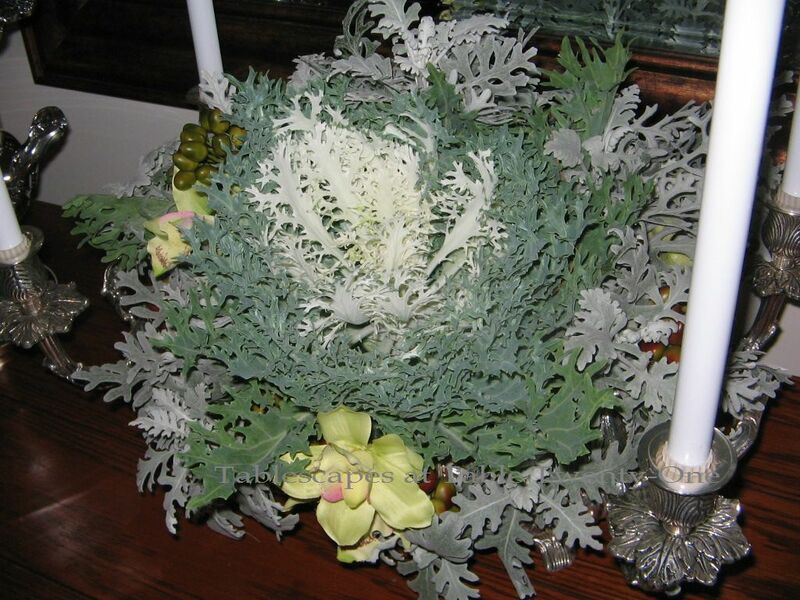 “Peacock White” flowering kale had both just the right color and texture I wanted mixed with the dusty miller, cymbidium orchids, and raw coffee beans. 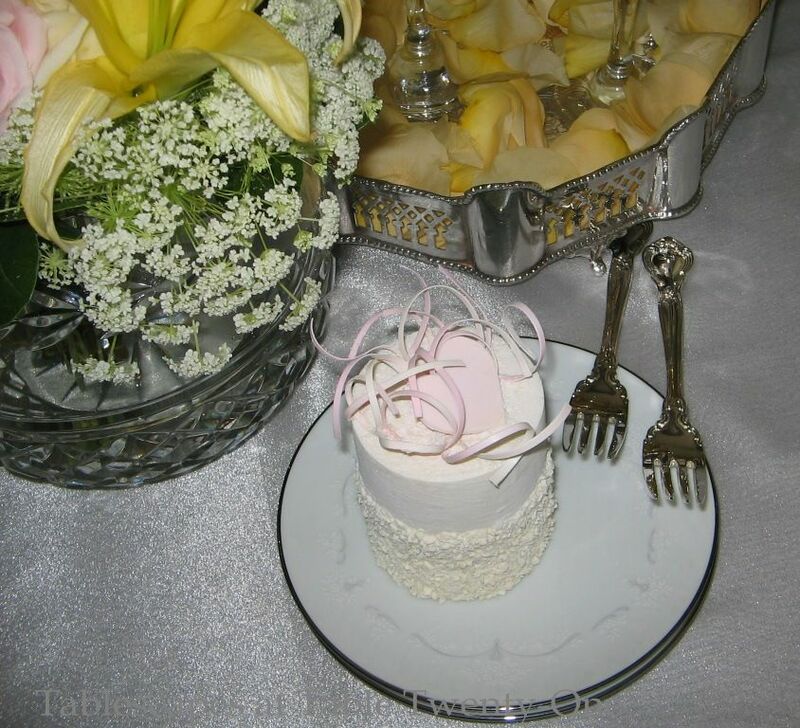 This heavy 4-light silver epergne (also seen here filled with mounds of baby’s breath at the “Princess Pink Birthday Party“) is a great buffet or centerpiece item, and it has a removable bowl for easy arranging and cleaning. Candles and a small floral on the china cabinet. 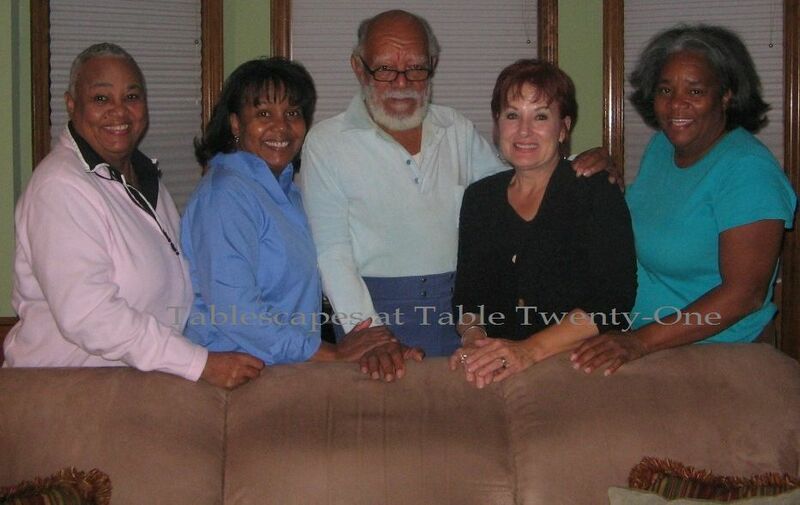 L to R: Mom, Me, Daddy, DeEtta, and the Birthday Girl…Barf!!! I’ve done a lot of teasing here (as always, because what are sisters for? ;-)), but I really do love my sister. She’s a very warm, kind, giving person with a heart as big as all outdoors. Yes, she’s weird and goofy…but she’s mine. 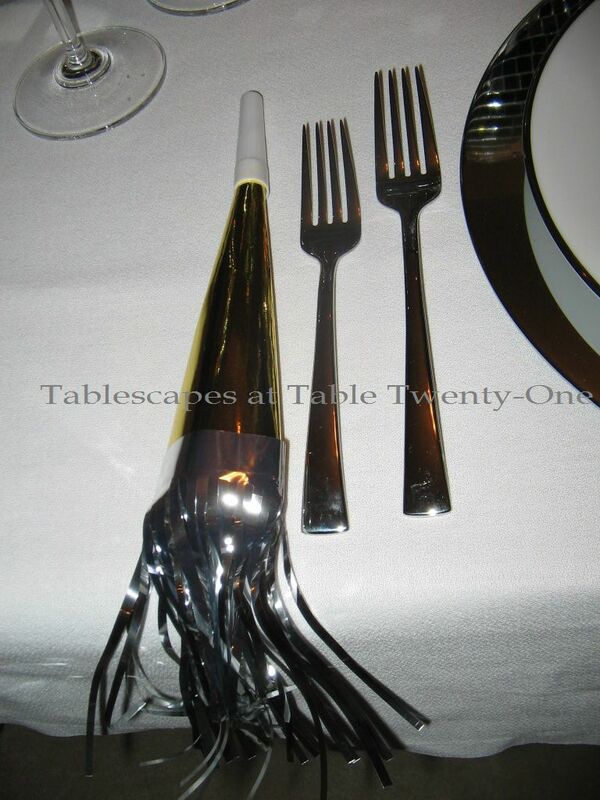 Note: This would make a great New Year’s Eve tablescape, too!!! 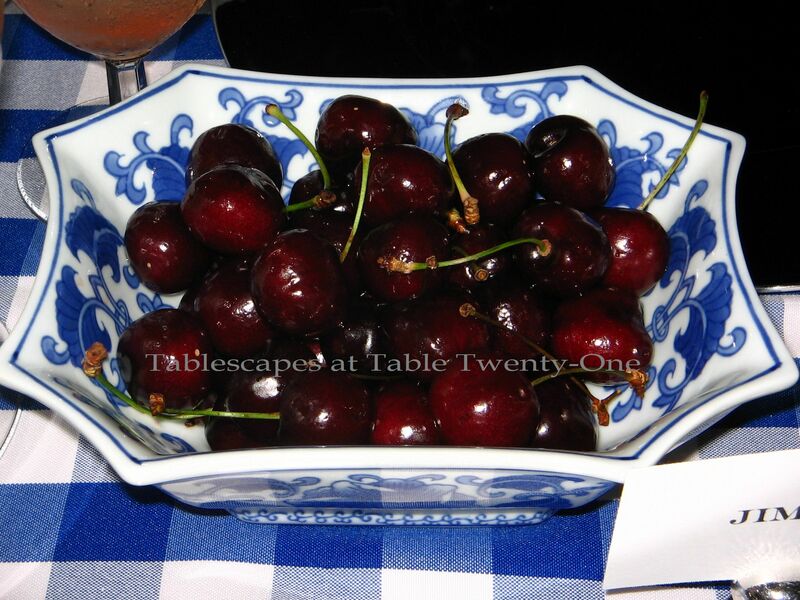 As is always my distinct pleasure, I am joining Susan and the other talented tablescapers from around the world for Tablescape Thursday this week. Won’t you come along? This is always a very intimate event, but one of the very biggest in my heart as the same friends gather each year to celebrate the battle won for one of us. Again this year we dined out on the deck, basking in the sunny warmth of a perfect 72 degree autumn day. 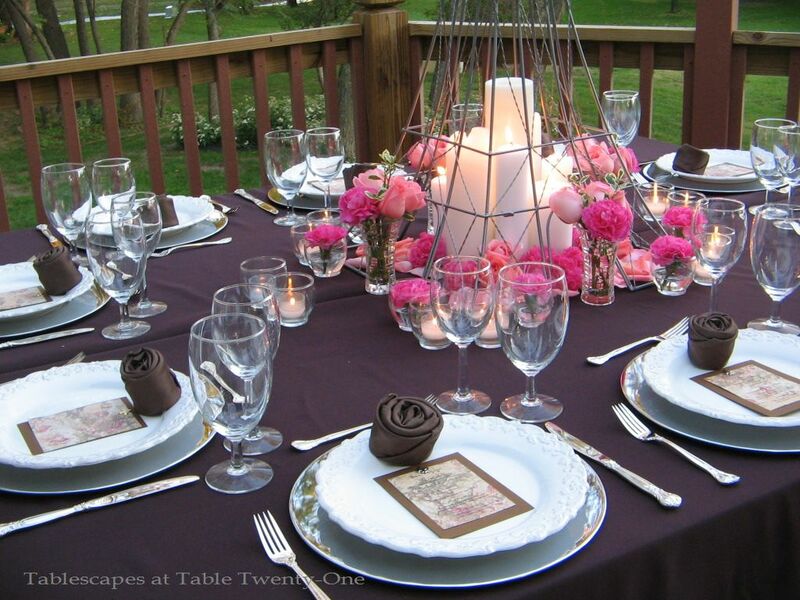 A generous layering of brown, pink and white linens is the starting point. I chose to use an 85″ x 85″ square top layer over the round ones beneath to provide a little more visual interest. 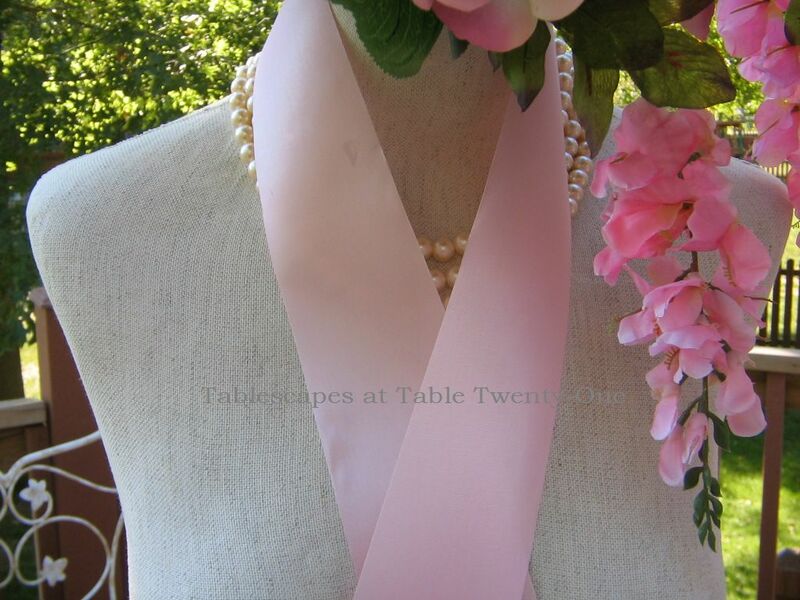 Soft pink cotton napkins are fashioned into replicas of the much-recognized pink ribbon that is the international symbol for breast cancer awareness. 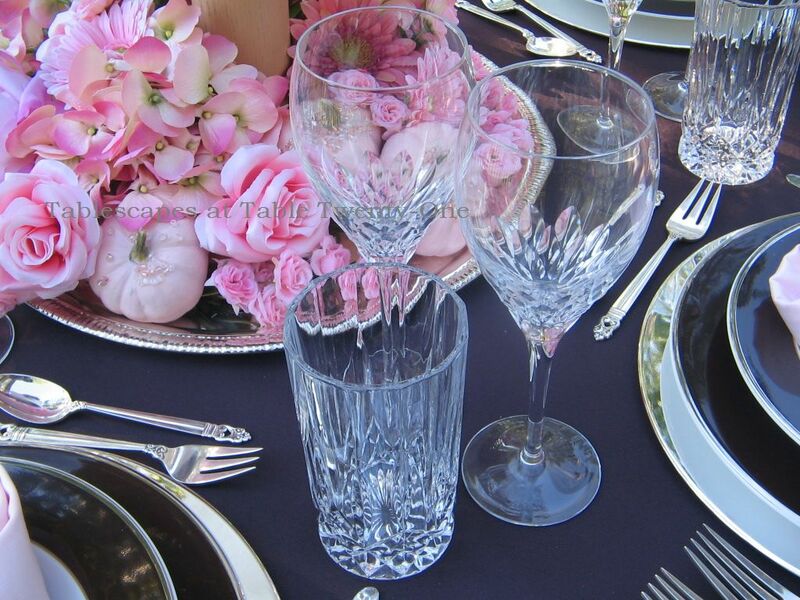 Godinger “Dublin” highball glasses are used to serve pink lemonade, while two Cristal D’arques goblets await wines served with the appetizer and entrée. 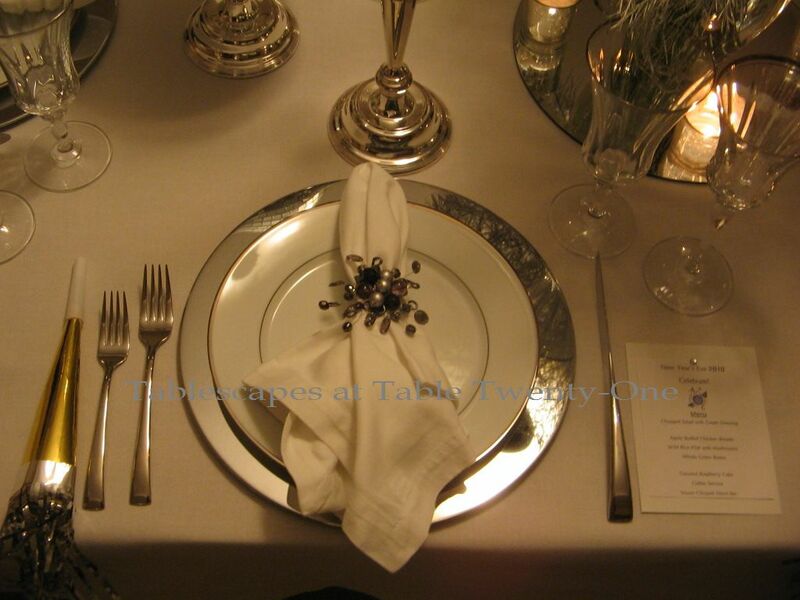 “Royal Danish” sterling silver flatware. 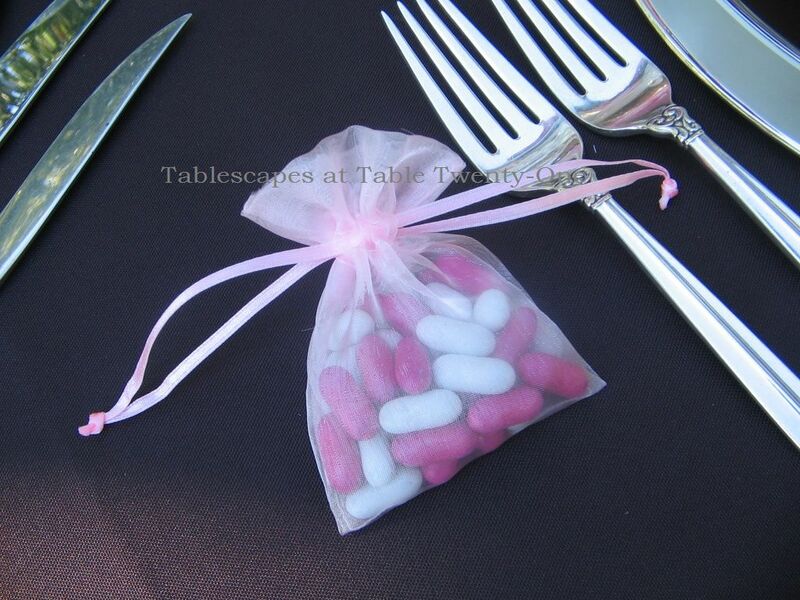 Pink organza bags of Good & Plenty licorice candies are a sweet treat for each guest. 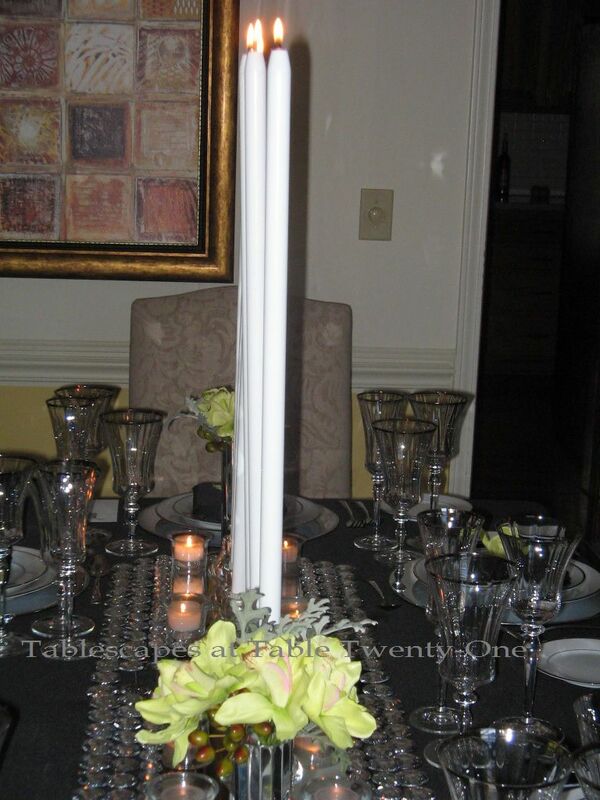 I used an adjustable height bust form from my dressing room as the foundation for the centerpiece. I chose to keep her uncovered so as to “expose” us all to breast cancer awareness. 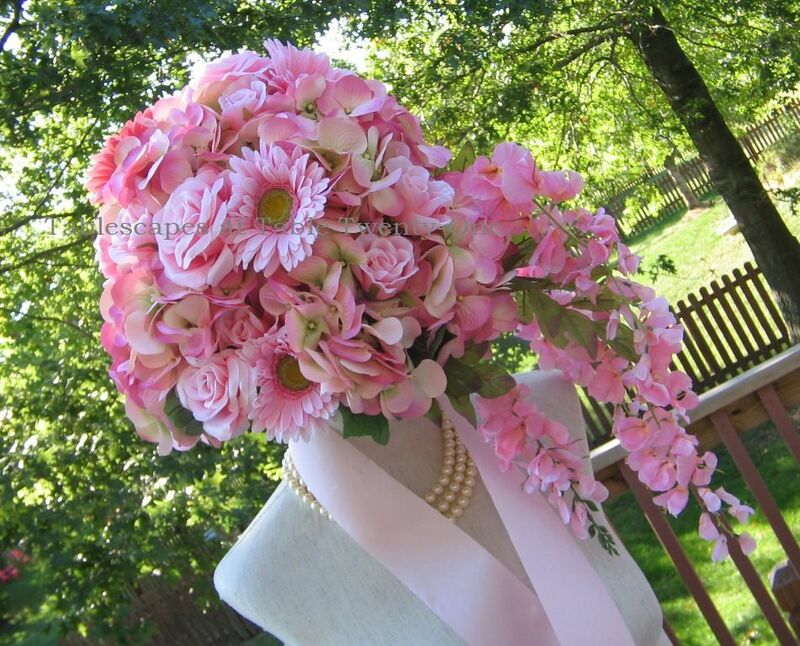 As many ladies do for luncheon, this bust form is adorned in a triple strand of pearls. The necklace peeks out from beneath a pink ribbon arranged to mimic the international symbol. 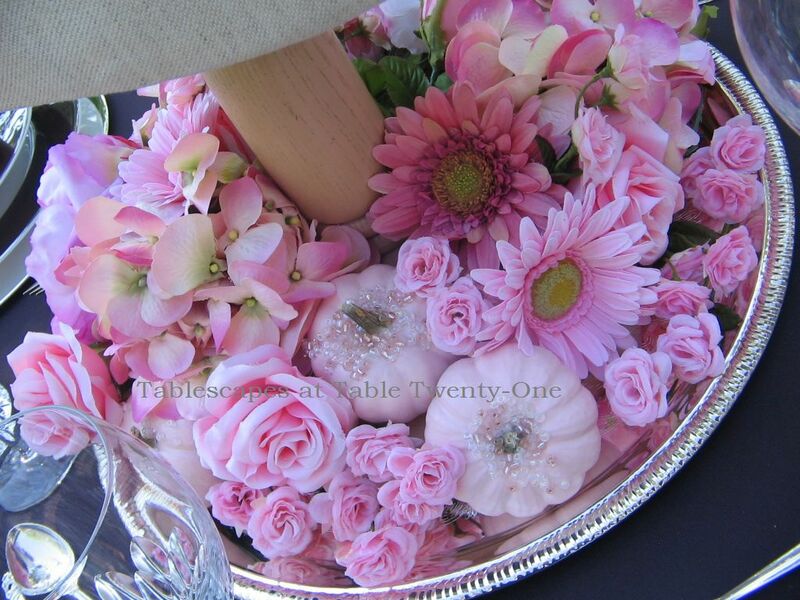 Clumps of fresh and faux flowers are arranged on a large silver tray at the bust form’s foot. 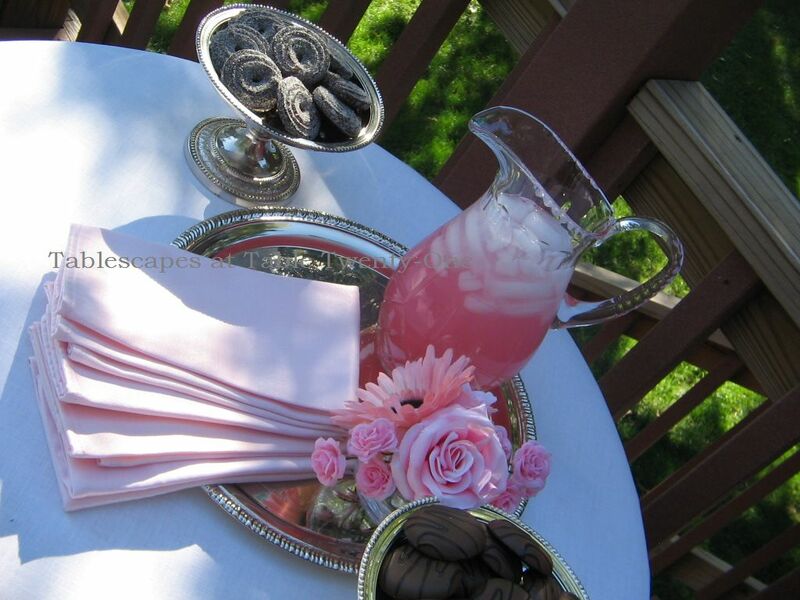 A small side table dressed in pure white linen offered sweet pink lemonade on a silver tray and two kinds of chocolate dessert cookies on silver beaded edge pedestal trays. 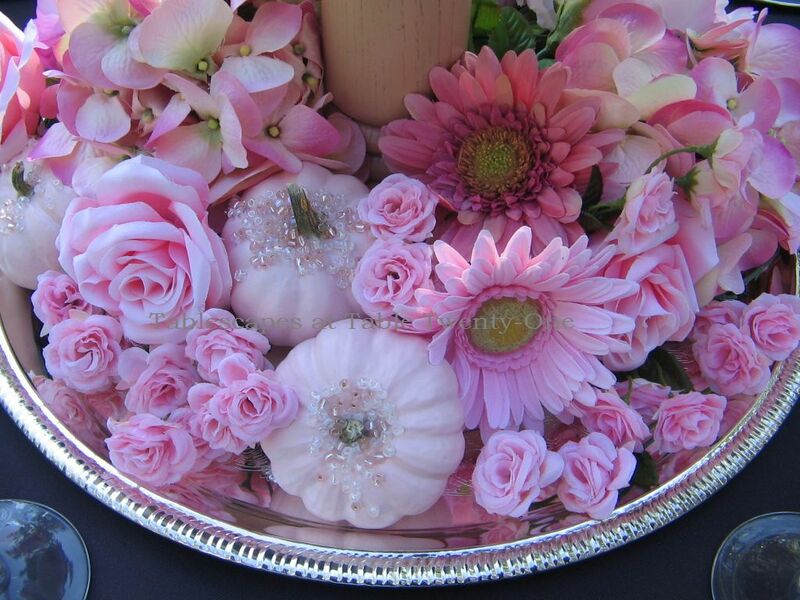 A diminutive bouquet of pink roses and a Gerbera daisy was arranged in a tiny Mikasa “Petit Points” crystal vase. 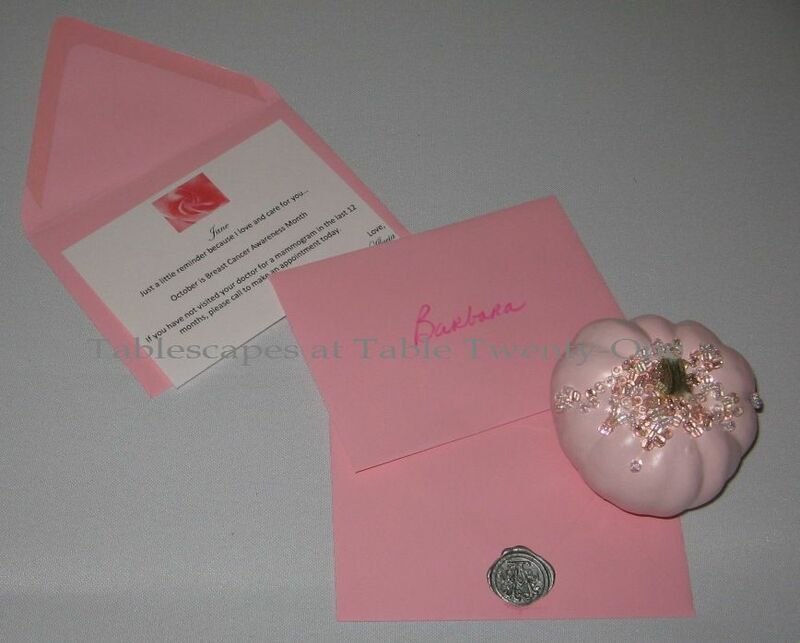 After the luncheon, each guest went home with a pumpkin and this note to remind her to get that all-important mammogram. Additional bling pumpkins were delivered a few days later to beloved neighbors. 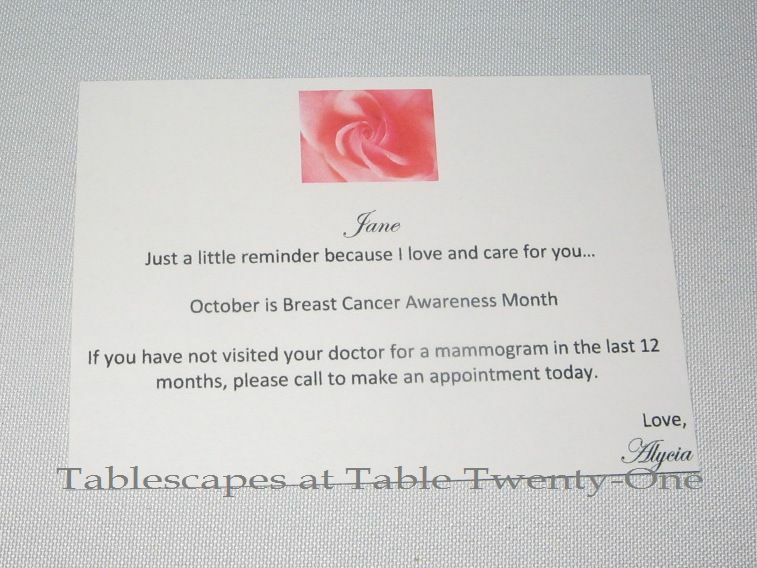 Please be sure to schedule that yearly mammogram, ladies! (Guys, encourage the women in your life to go! And as for you fellas, uh….prostate check!!!) It could be – as with my friend who was diagnosed early – a true matter of life and death. Choose life. Get that mammogram! 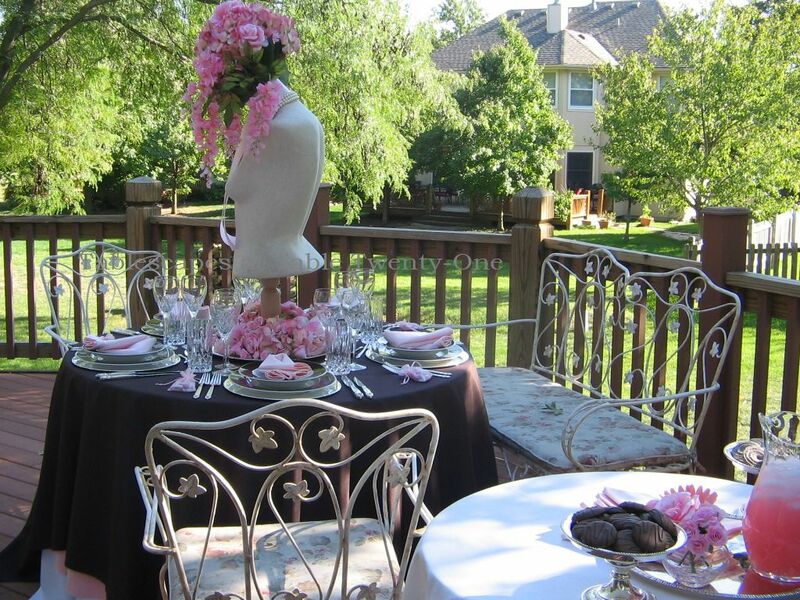 Join us, won’t you, for Tablescape Thursday at Between Naps on the Porch and Bev’s “Pink Saturday” at How Sweet the Sound! And don’t forget to check us out on BeBetsy.com!! for helping me to spread the word! Congratulations once again to the winner of the Mikasa “Daylight” Giveaway, Marlis Bennett of Creative Journeys!!! All the entries were beautiful and creative, and it pained me deeply that only one person could win. But since those were the contest rules, Marlis was awarded the grand prize and I tip my hat to her. Enjoy, Marlis! 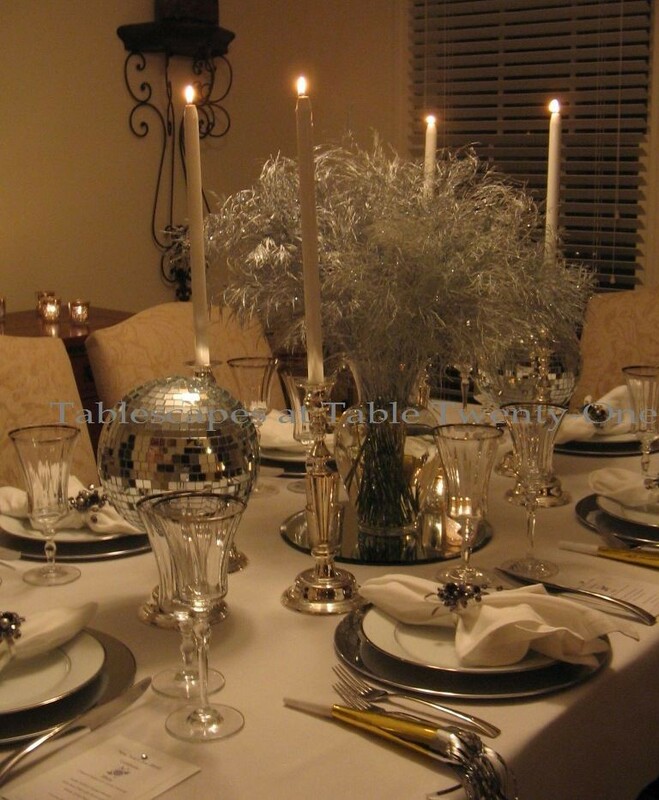 This week’s tablescape is in response to Angela who requested help via Facebook with designing a sleek, sophisticated, uncluttered and inexpensive tablescape for entertaining a prospective client. Tall order, Angela! All that and inexpensive??!?!! Well, here ya go…my interpretation of what that might look like. I considered what I wear when I’m looking to convey sleek sophistication, and nothing fills that bill like a little black dress! 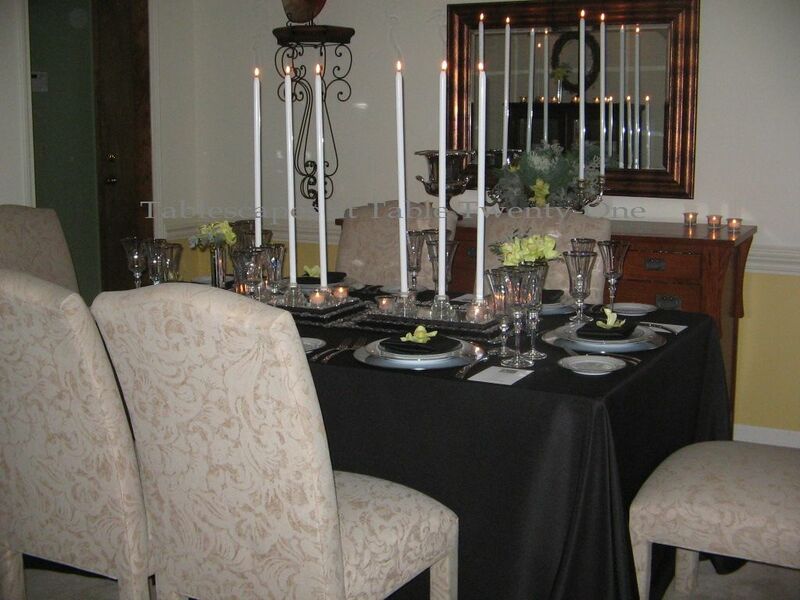 So the table is dressed in a sultry black linen. Accessories? I usually put on either pearls or understated diamonds and finish off the look with a dramatic slick of juicy red lipstick. 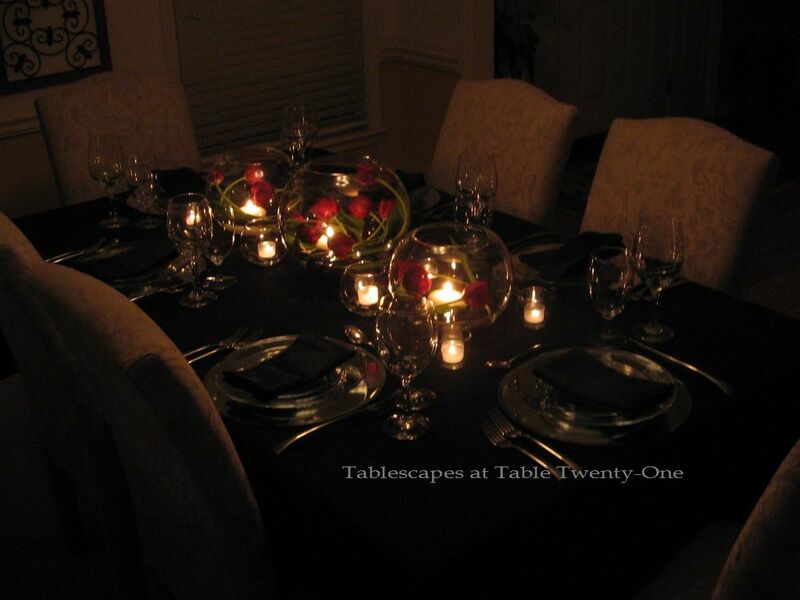 There’s my inspiration for this black and red tablescape! 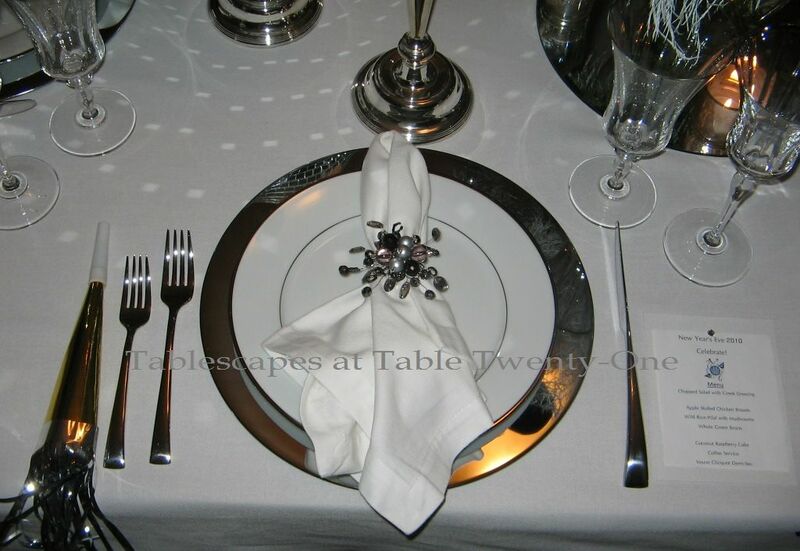 Sleek silver chargers are topped with an inexpensive crystal clear dinner and salad plate (the diamonds) from Bed, Bath & Beyond. 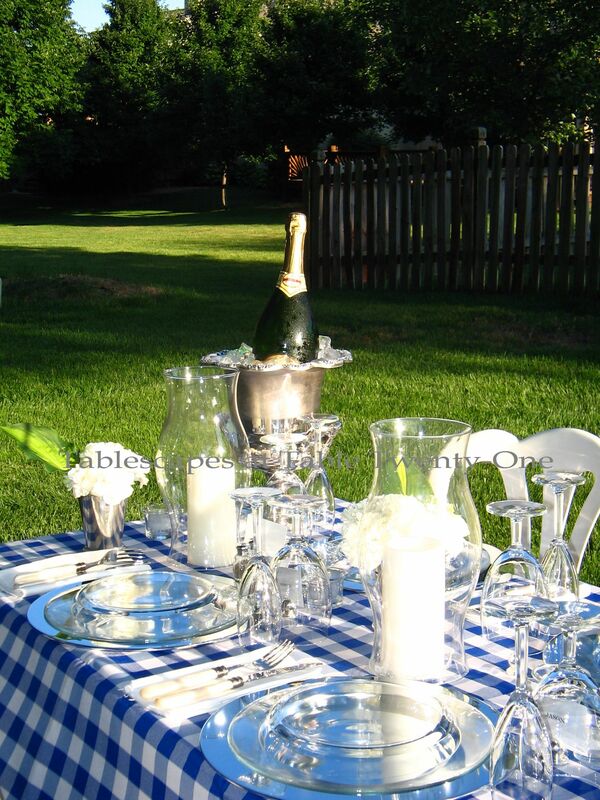 Simple and cost effective clear water and wine glasses keep pace with the simplicity of the place setting. 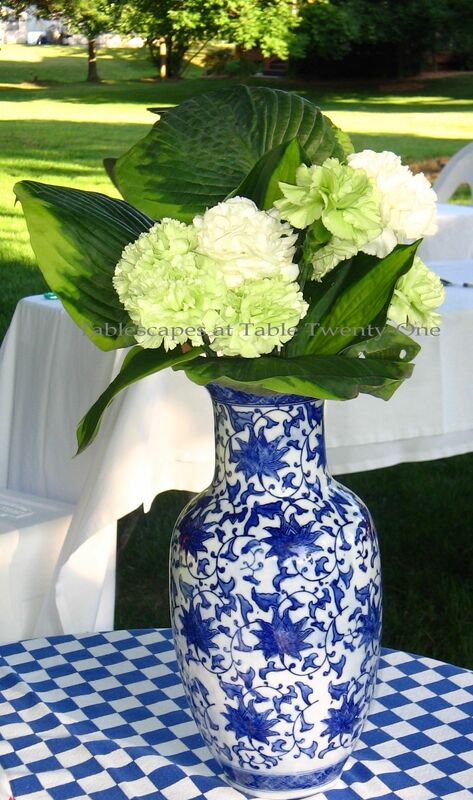 (I buy these in bulk from Old Time Pottery and Pier 1.) 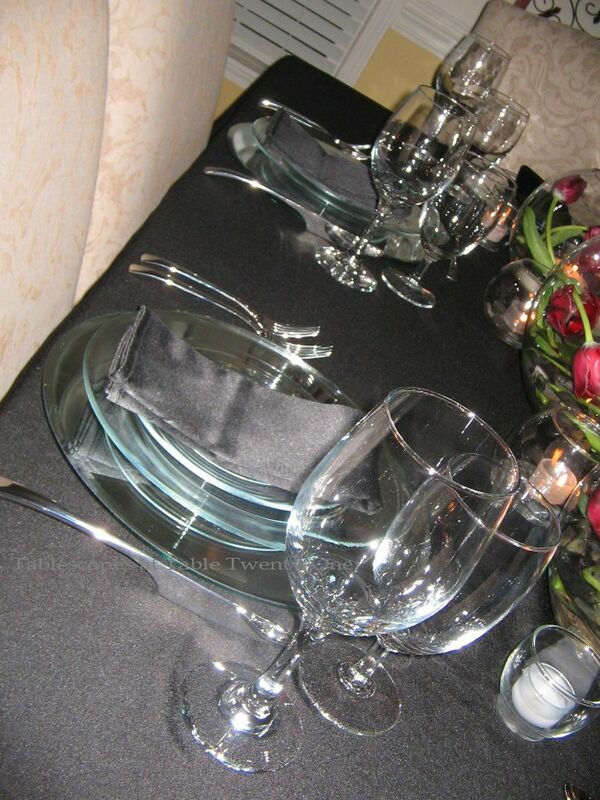 A simply folded black napkin rests on top of the stack to quietly bring the drama of the black closer to the surface of the tablescape. Sleek, unadorned J. 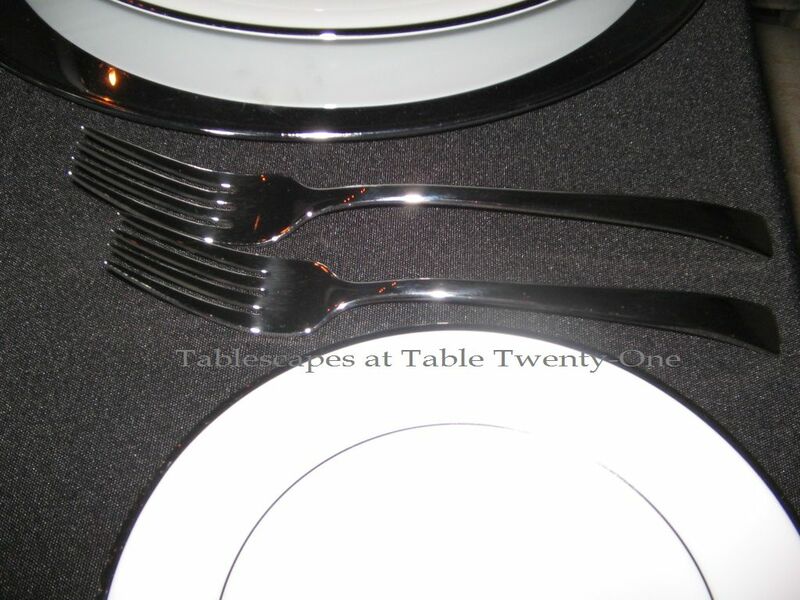 A. Henckels “Bellaserra” stainless flatware finishes each place setting. 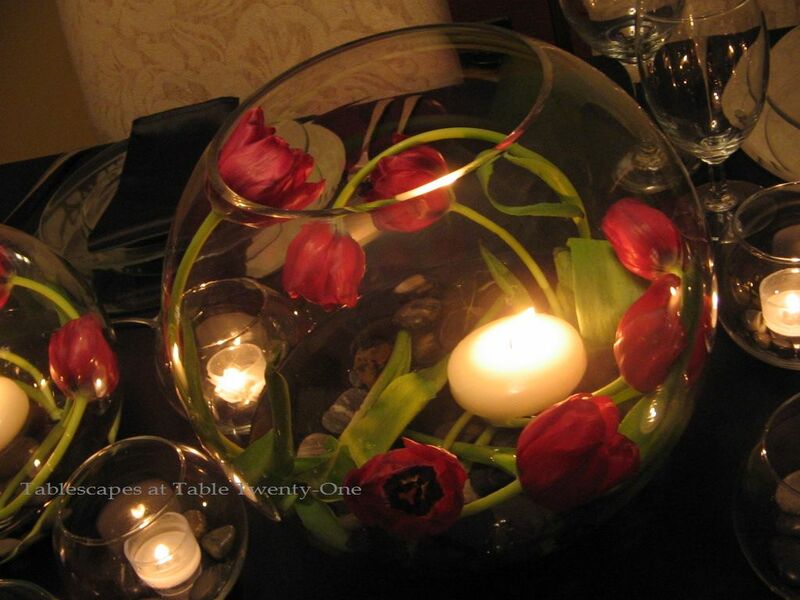 Here’s where that slick of ruby red lipstick comes in: brightly colored tulips submerged in glass spheres, anchored with black river rock. 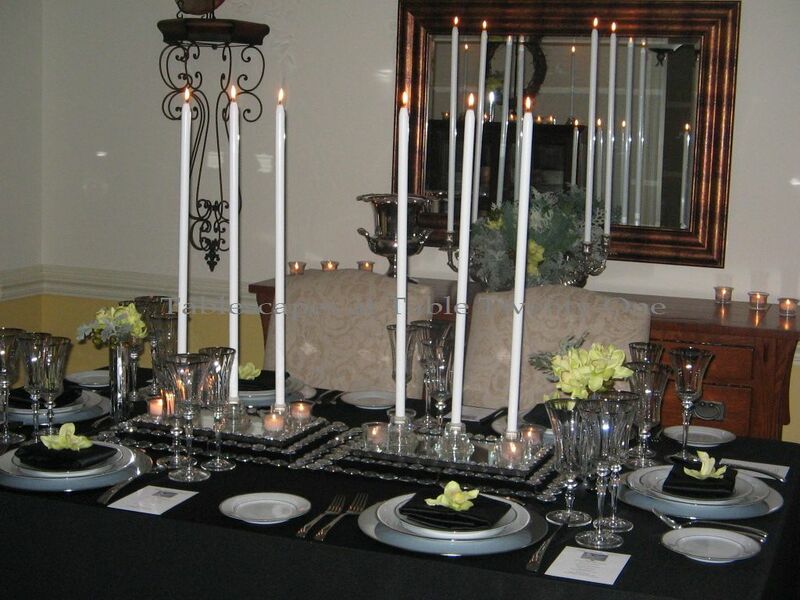 Smaller, similarly shaped votive holders extend the candlelight from the floaters in the floral arrangements. A little river rock is added to the bottom of the votive holders for design consistency. (River rock in various colors can be purchased at craft stores like Hobby Lobby and Michaels. 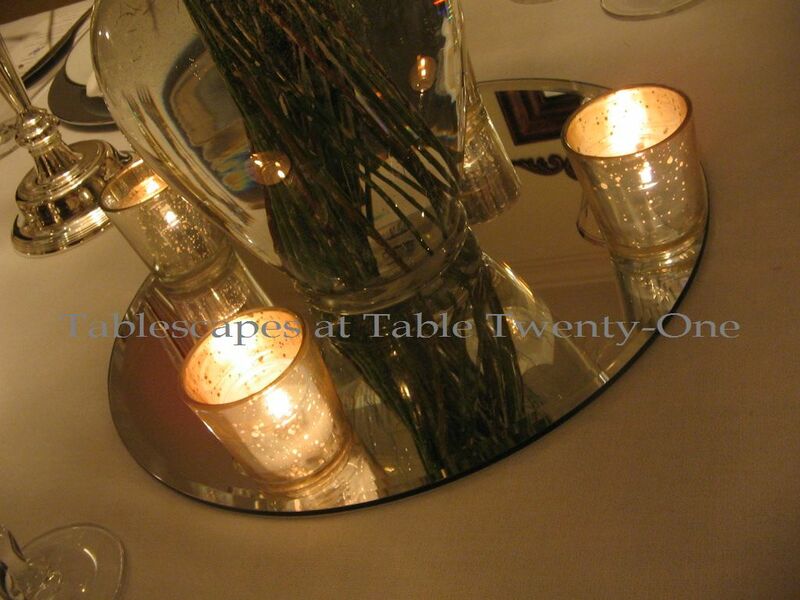 The same goes for the glass spheres which can be used for myriad tabletop designs. Both are on sale for 50% off about every 6 weeks, so watch the sale ads and pick up twice as much for the price!) 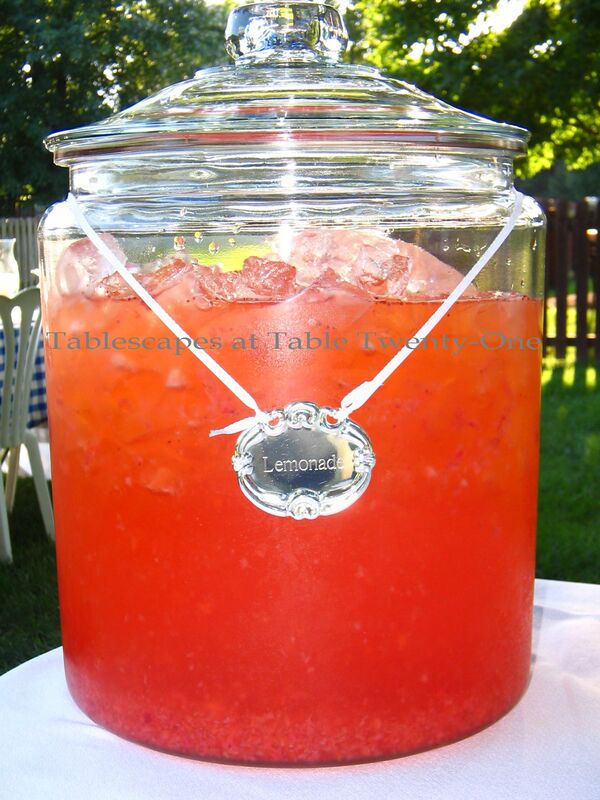 Flowers submerged in glass vases allows for an impressive look without the expense of the numbers needed for full bouquets. 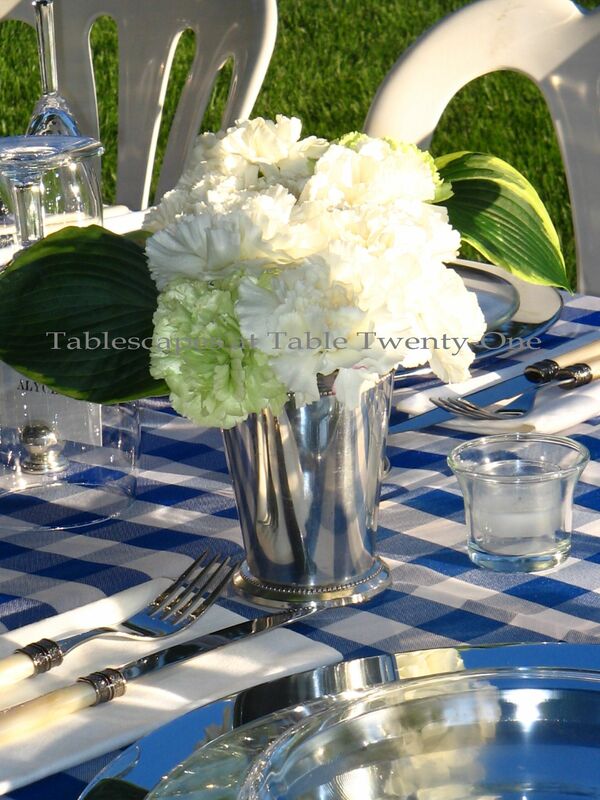 A simply arranged vase of tulips sidles up to a mirrored charger of Mikasa’s leggy “Sophia” tall sherbet glasses. 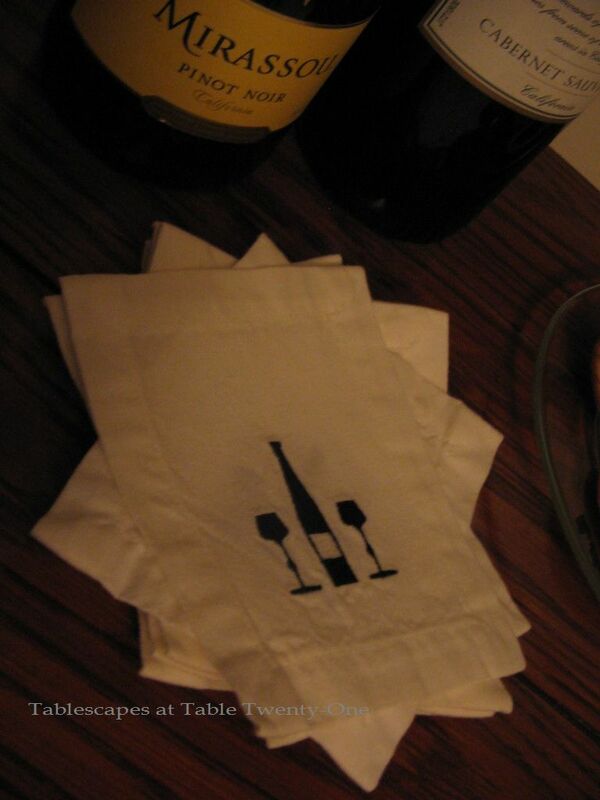 I picked up these cute linen cocktail napkins at Bombay Company before all the U.S. retail outlets closed. They are perfect for dabbing away the remnants of a sip and a nosh before dinner. 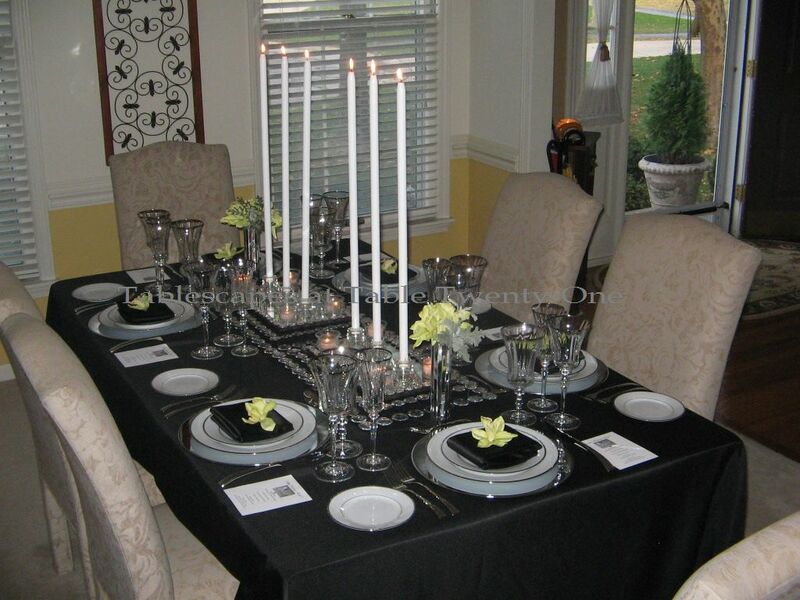 Well, Angela, this is my take on a slick black tablescape with red accents. 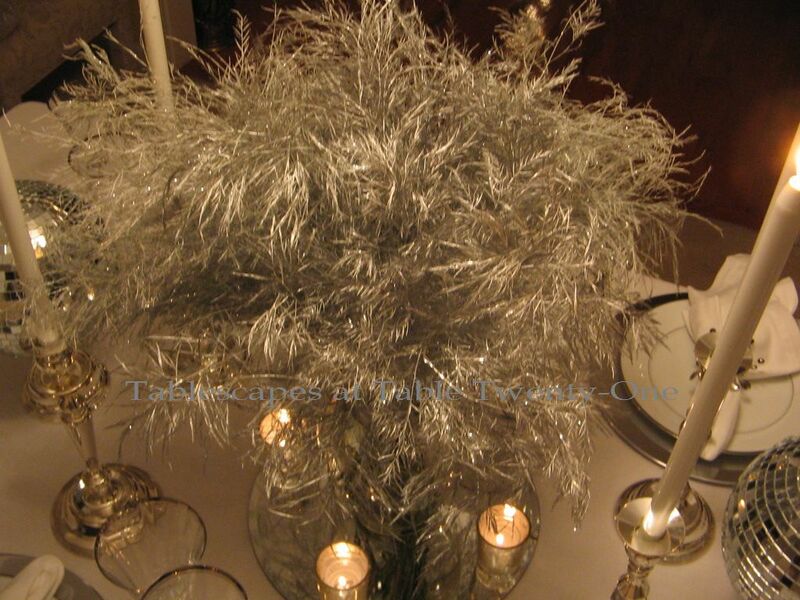 While you are planning to use it as a spring tablescape, it would also be great for a fabulous New Year’s Eve tablescape, or any time of year with a quick change of flowers. 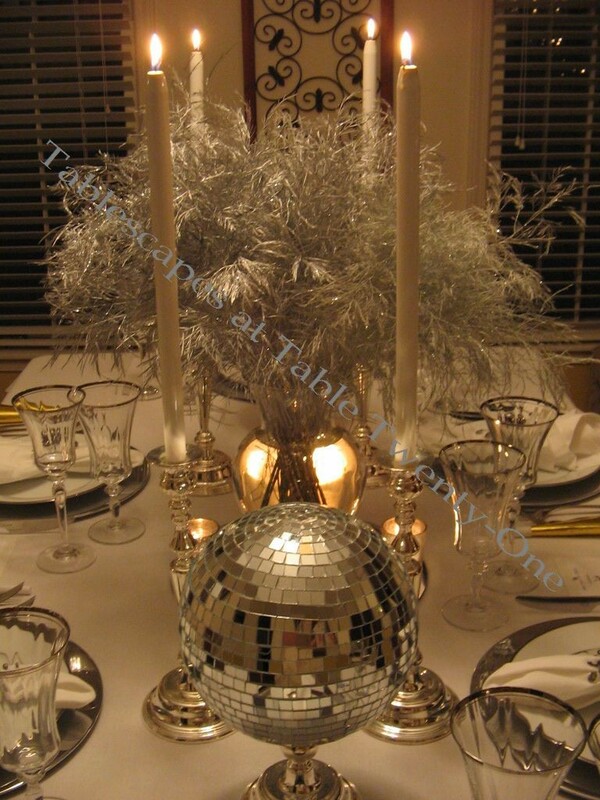 I hope this helps to get your own table ready for the big night! Good luck to you, and please let me know how it goes! 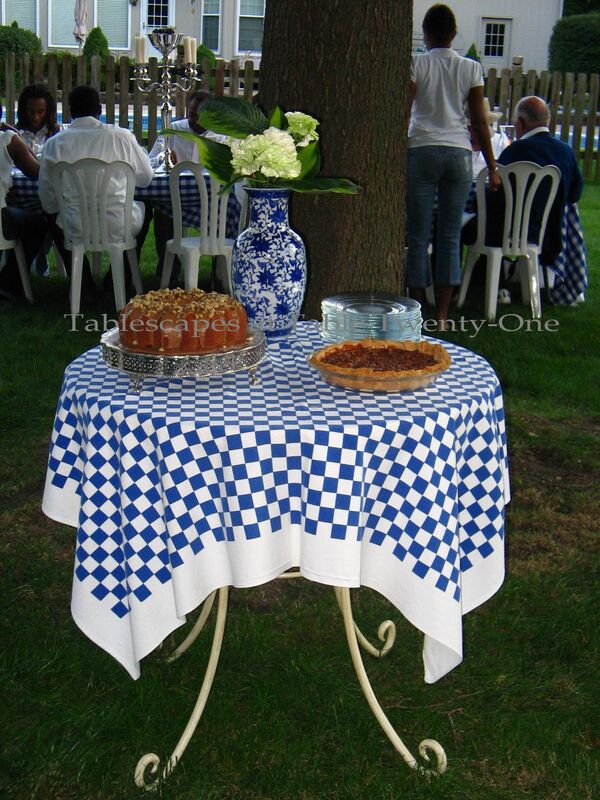 Linking to Susan at Between Naps on the Porch on Wednesday after 9:00 p.m. for Tablescape Thursday! Hope to see you there! Stuck inside with a half-foot of snow on the ground, I was happy to have the company of the Moms who braved the snow-packed roads today for a planning meeting/ladies luncheon. Even though I officially retired in 2010 (ha! 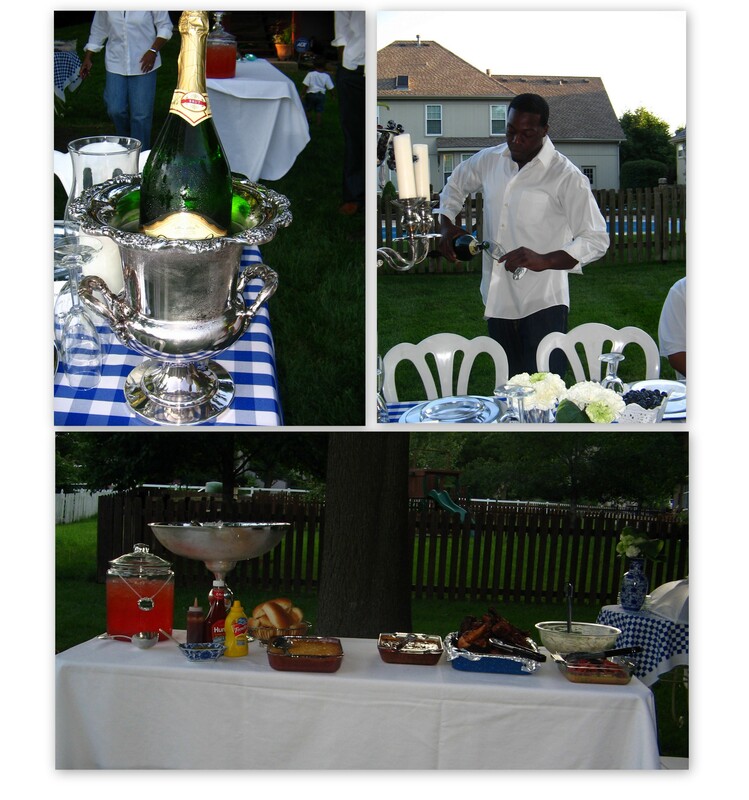 ), I find myself drawn to lending a hand to friends and family members who are planning a wedding. The week after New Year’s, I found myself hosting an update meeting with the mothers of the bride and groom. I set up a small table for three near a window so that we could enjoy a view of the untouched snow in our back yard. 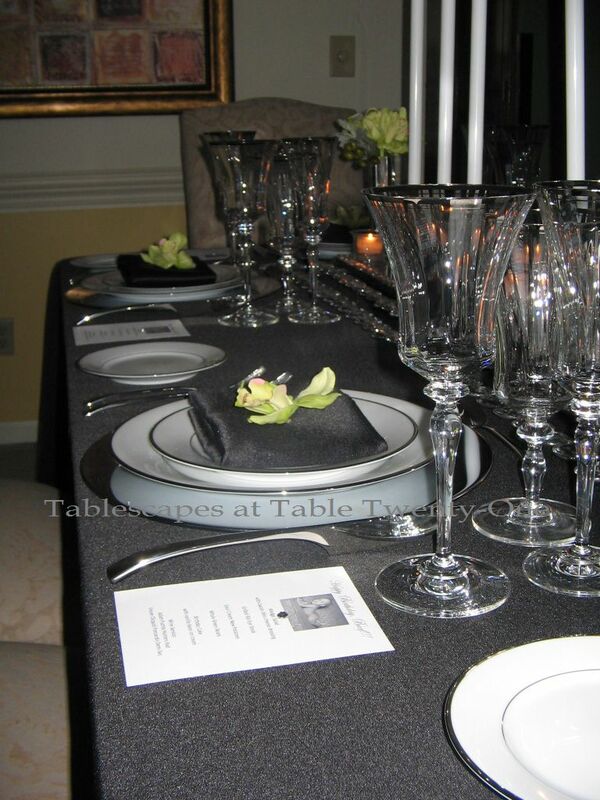 We needed room to spread out with notebooks and such, so the table was simply and sparsely set. 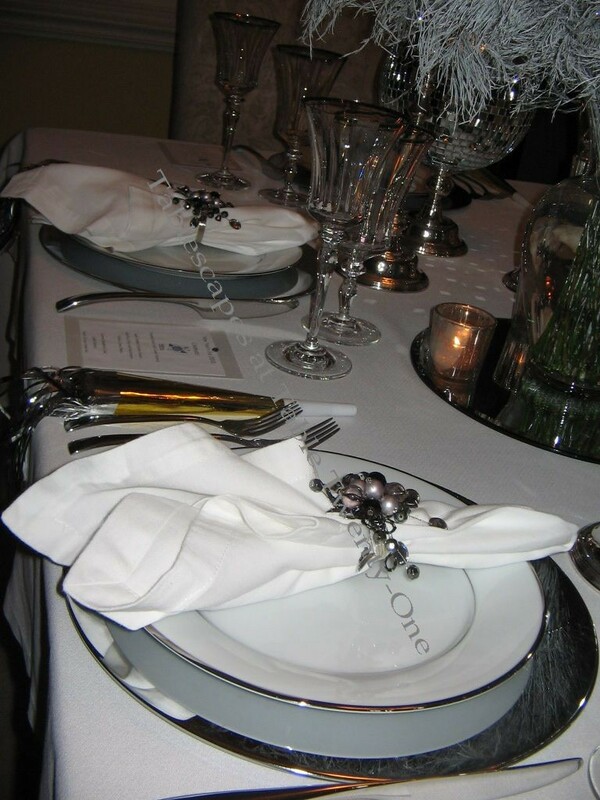 Beaded edge silver chargers on a crisp white linen were topped with my very traditional Easterling “Majestic” china. 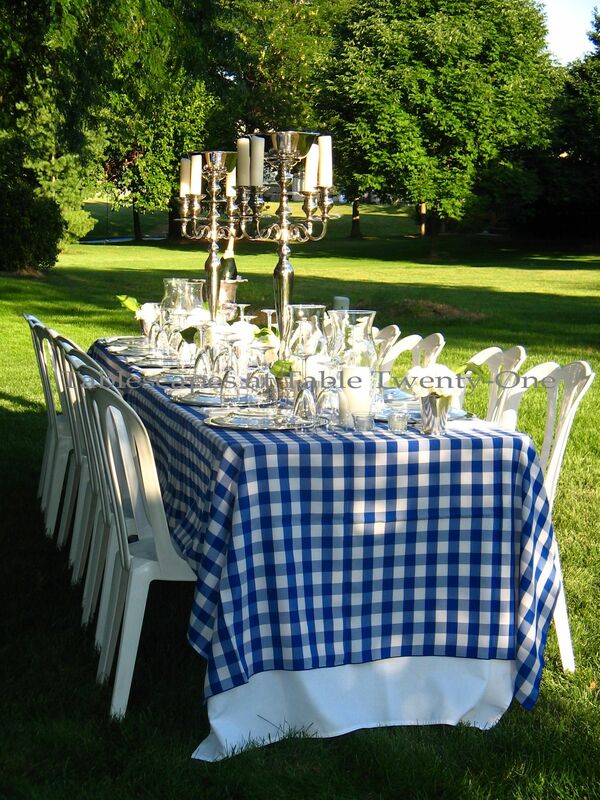 When planning a dinner party or luncheon, I try very hard to match the table setting to the taste of the guest(s) of honor. 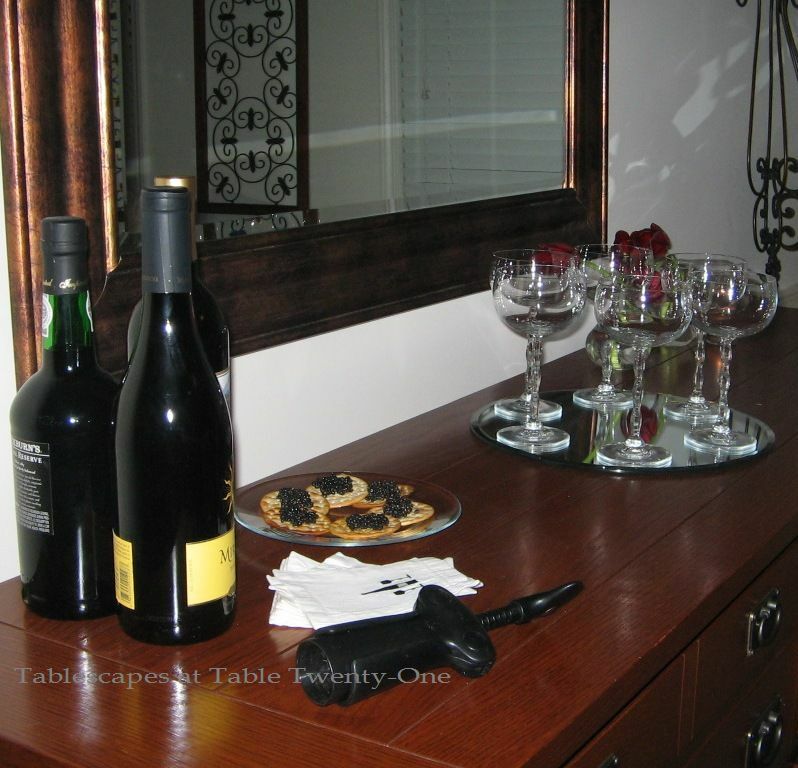 In this instance, both mothers are very traditional, so I stuck with classic pieces including heirloom silver and beautifully cut Mikasa stemware. 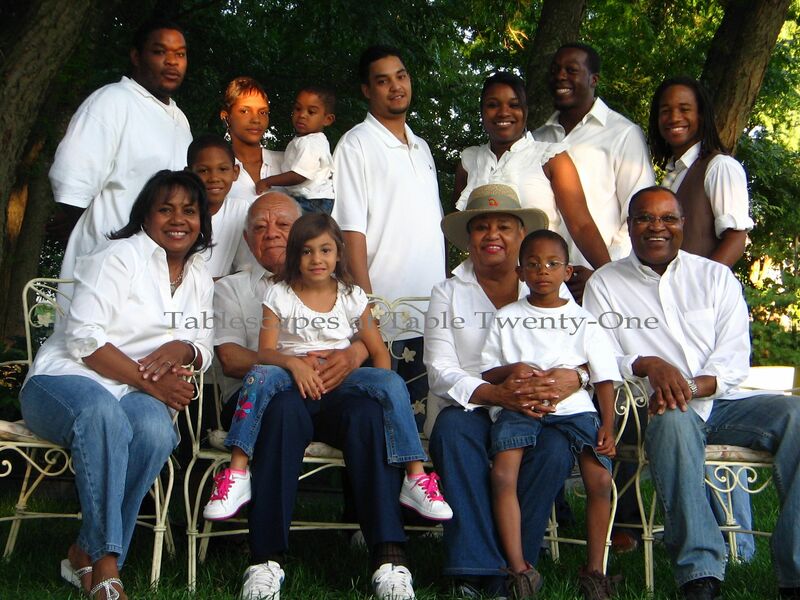 Remembering that the mothers share a fondness for the color purple, I paired that with silver and white. (They had both lobbied passionately for purple as a wedding color, but lost that battle to the bride. 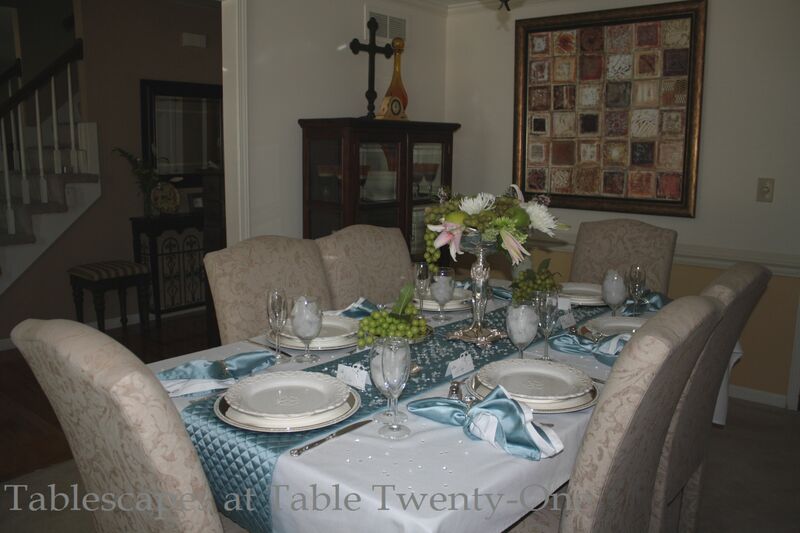 🙂 ) It really helped to liven up the tablescape! 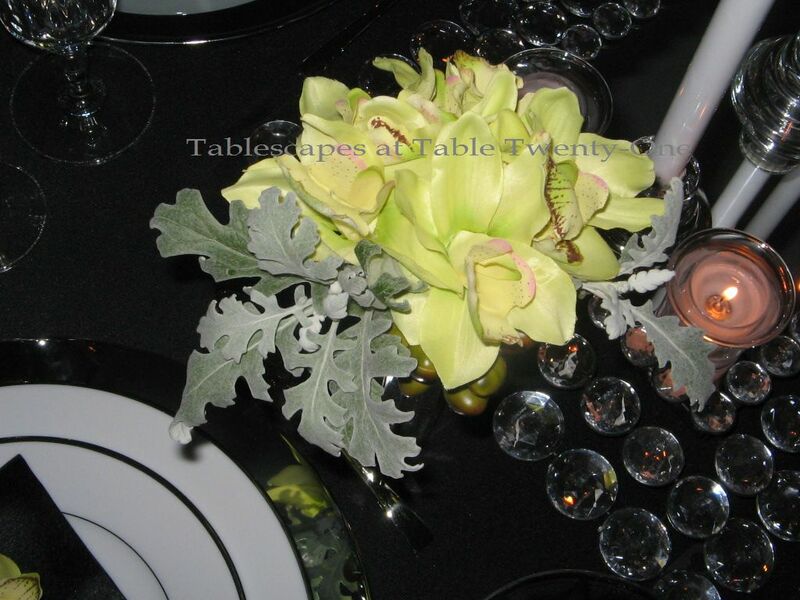 Tucking a humble purple carnation into each napkin extended the color from the centerpiece. 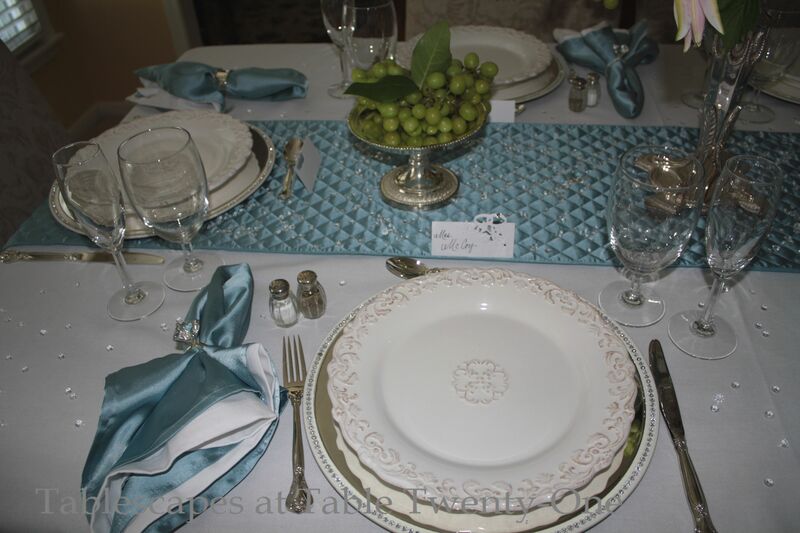 Click here to see all the photos for Planning in Purple, or click the “Weddings” tab above! 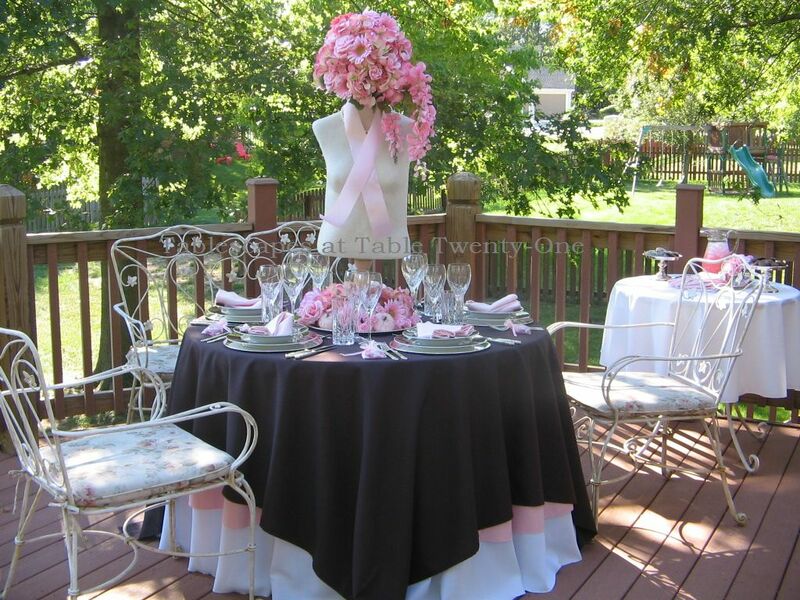 Don’t forget to join Susan and the other tablescapers this week at Between Naps on the Porch for Tablescape Thursday!!! I can only live vicariously through others since I have such a profound fear of flying. Thank goodness I have lots of friends and family who are ready and willing to hop on a big metal bird at the drop of a hat! Their adventures become my adventures, and this time is no different. 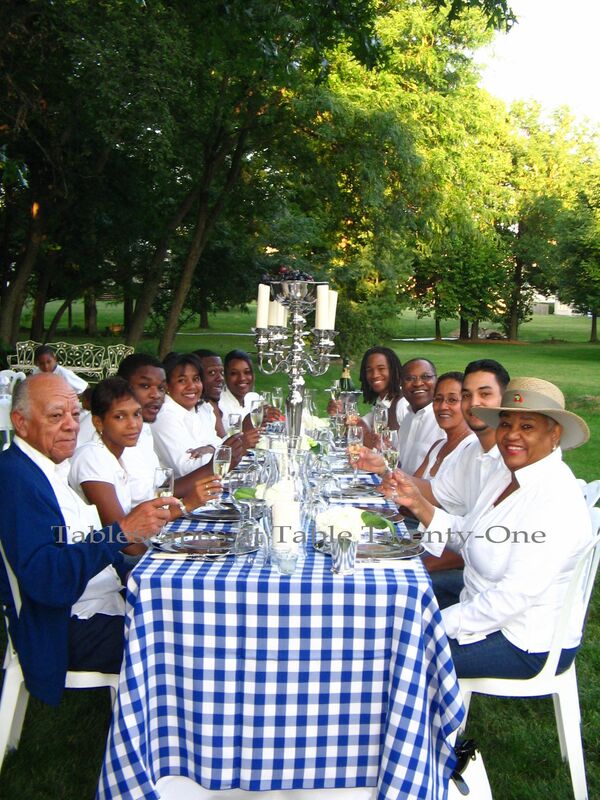 As our pals head across the ocean to Paris, France, they can reminisce about the bon voyage dinner held in their honor. And as they wine & dine in the great restaurants, they can giggle about my lame attempt at recreating the fine cuisine. 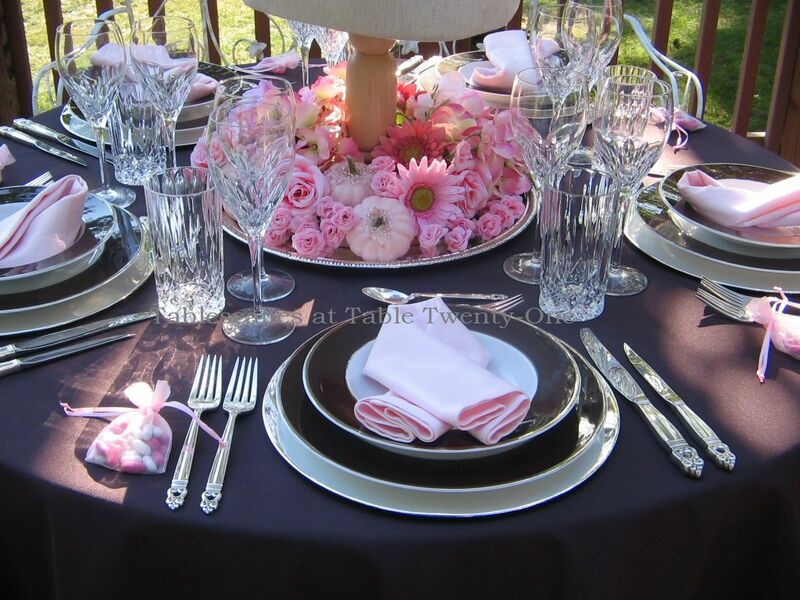 I am a pink freak, so it’s always exciting to do a table for someone else who shares that passion. We have said au revoir to summer here in the Midwest, but the outdoor temperatures belie that fact with daytime highs in the 70s and 80s. 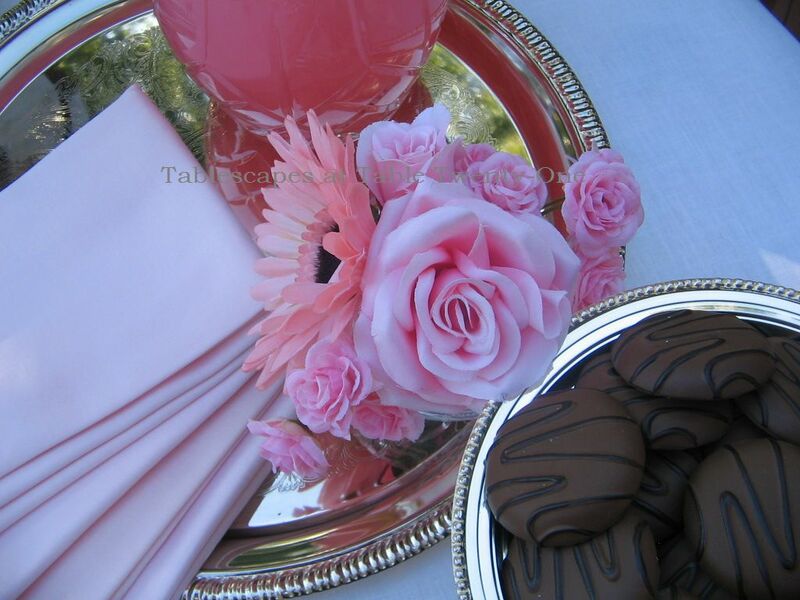 So to bring in a bit of autumn and tone down the pink a bit, I used chocolate as the base color for this tablescape. 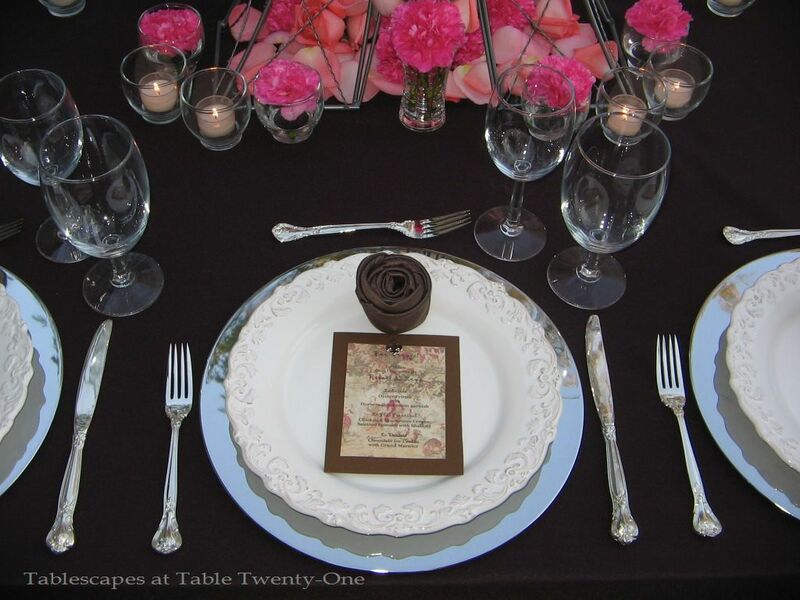 Atop the creamy chocolate table linen are gleaming silver chargers & flatware to keep the brown from washing out and looking so flat. A plain, creamy earthenware with a decorative rim was used to show off the food. I created the fun little menus on my computer using cardstock and fleur de lis brads from Hobby Lobby. The pink toile scenes reminded me of the French countryside in a time when men and women actually strived to be described as “genteel.” The fun font I used reminded me of the font used on the posters promoting the 1958 movie “Gigi”, set in turn-of-the-20th century Paris. I recently bought another book on napkin folding. (Shh! Don’t tell my husband!) This cute little fold looks like a “petit pain.” (Translation: bun.) It was a lot easier to create than I thought it would be and looked really sweet at the top of each plate. (Check out the “Books That Make You Go “Ooh!” tab at the top of the page for more information “Napkins With a Twist” by David Stark.) 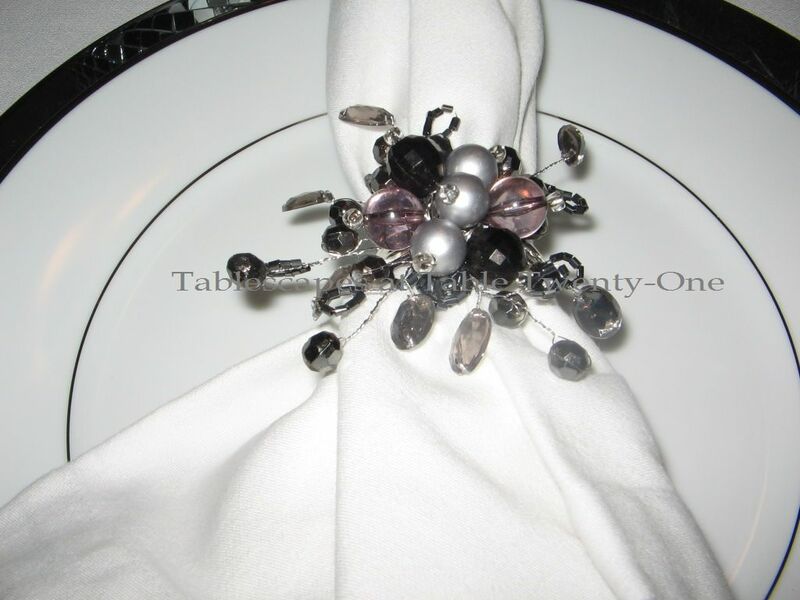 For a complete tutorial on how to create this napkin fold, click HERE and scroll to Tip #33. 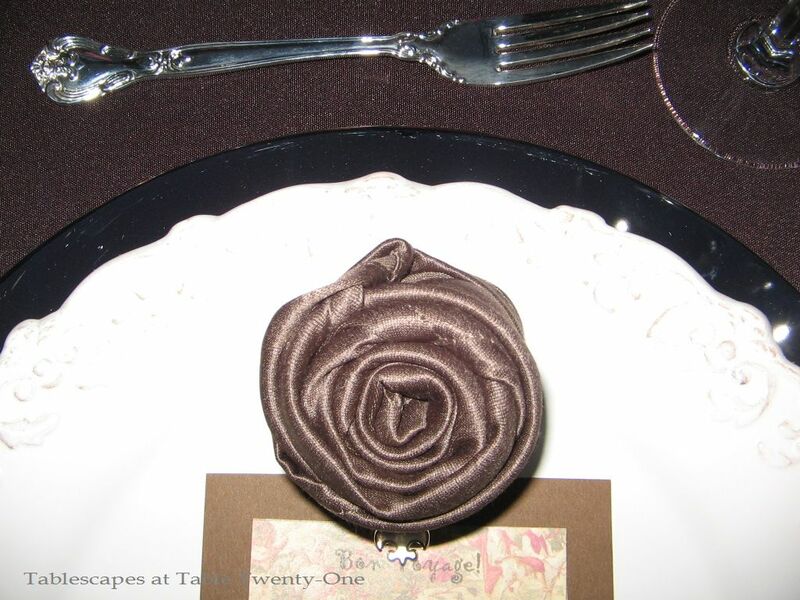 To see other posts on this site using the rosebud napkin fold, see “Cupcake Colors”, “Springtime in Paris Mother’s Day Buffet” and “Mother’s Day Luncheon in Pink”. 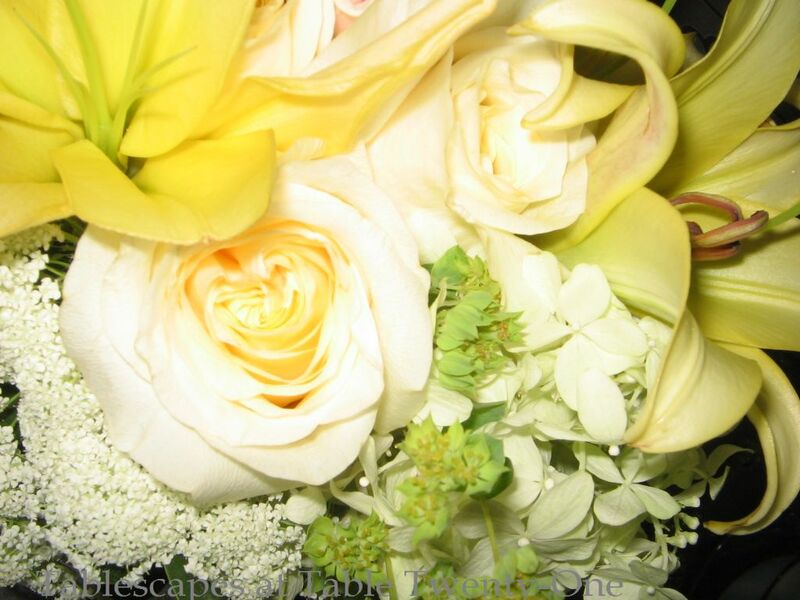 This night was a little warm, and that just brought the sweet smell of these pretty posies to the fore. Wonderful! 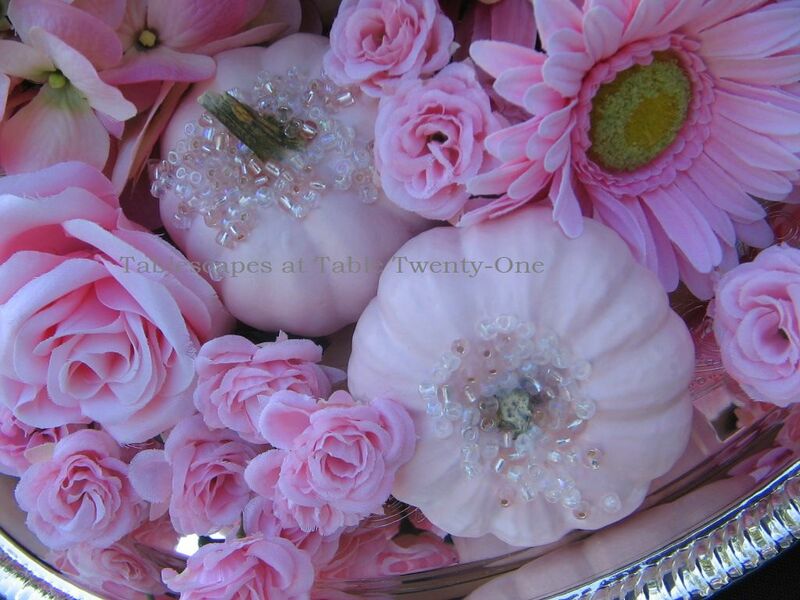 I chose roses and carnations because they are so pretty together, and the variation in the depth of pink in the roses was interesting. Both were clipped within an inch of their little lives to create the mounding effect at the bottom of the tower and to float in the clear oyster votive cups. Stray rose petals helped to fill out the look. 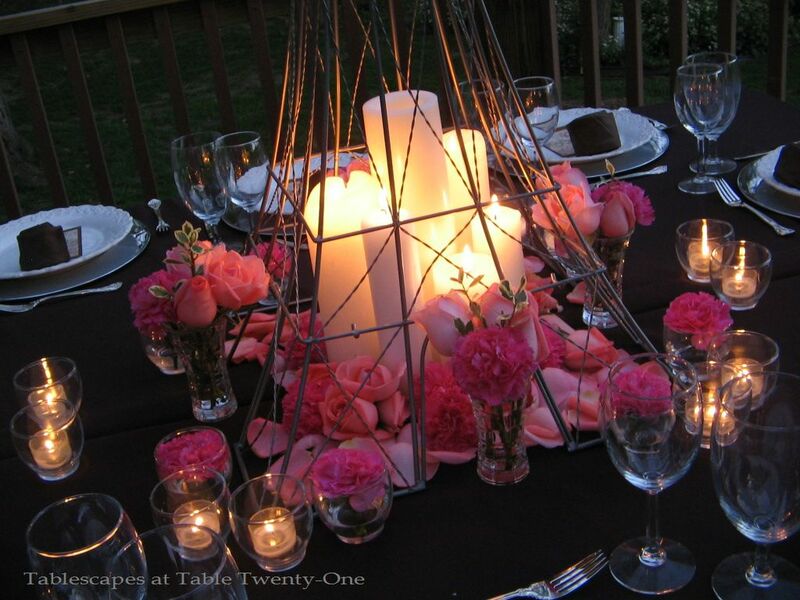 To add just a bit of height and visual interest on the outside of the tower, I arranged the roses and carnations in clear vessels with a just a teensy bit of greenery. 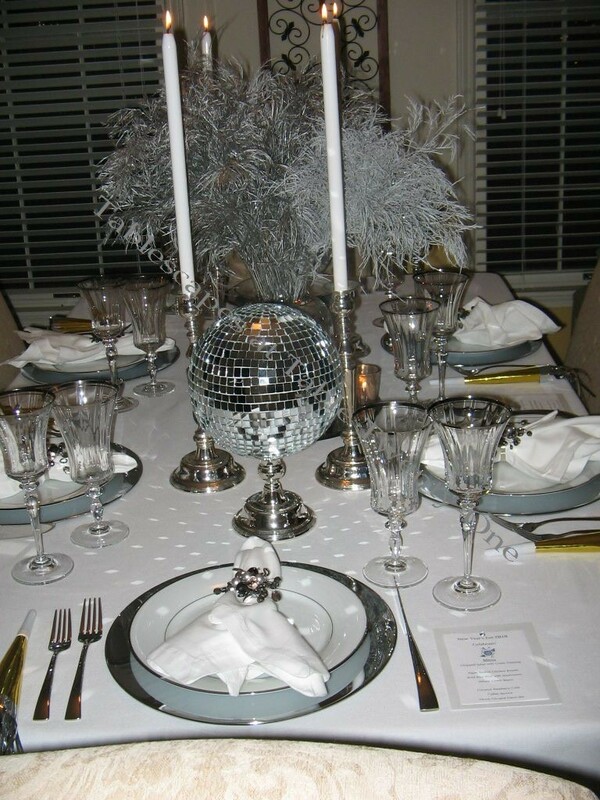 Please pardon my French, but I am plein de joie to once again be a part of the Style Sisters’ Centerpiece Wednesdays and Susan’s Tablescape Thursdays.